This page is envisioned as a comprehensive bibliography of texts treating A. C. Sandino & the US intervention in Nicaragua, including scanned pdf files of key published works (like all of Sandino's writings, Somoza's book, etc.) and of rare published and unpublished texts, with references & links to other websites treating the golden age of US imperialism in the circum-Caribbean & beyond. What appears below is a start. Marine Corps Research Center, Quantico VA. Naval Historical Center, Washington Navy Yard, Washington D.C.
Instituto de Historia de Nicaragua y Centroamerica de la Universidad Centroamericana (IHNCA-UCA), formerly the Instituto de Historia de Nicaragua (IHN-UCA), formerly the Instituto de Estudio del Sandinismo (IES), Managua. Aguilar, Alonso. Pan-Americanism from Monroe to the Present. New York: Monthly Review, 1965. Browning, David. El Salvador: Landscape and Society. Oxford: Clarendon, 1971. Beisner, Robert. From the Old Diplomacy to the New, 1865-1900. 2nd ed. Arlington Heights, Ill: Harlan Davidson, 1986. Bourgois, Philippe. Ethnicity at Work: Divided Labor on a Central American Banana Plantation. Baltimore: The Johns Hopkins University Press, 1989. Bulmer-Thomas, Victor. The Political Economy of Central America since 1920. Cambridge: Cambridge University Press, 1987. Calder, Bruce J. The Impact of Intervention: The Dominican Republic during the U.S. Occupation of 1916-1924. Austin: University of Texas Press, 1984. Calderón, Fernando, ed. Los movimientos sociales ante la crisis. Buenos Aires: CLACSO, 1986. Callcott, Wilfrid H. The Caribbean Policy of the United States, 1910-1920. Baltimore: The Johns Hopkins University Press, 1942. Cardoso, Ciro. "História económica del café‚ en Centroamérica (siglo xix)." Estudios Sociales Centroamericanos 4 (1975): 9-55. Cardoso, Ciro. "Central America: The Liberal Era, c. 1870-1930," in The Cambridge History of Latin America, edited by Leslie Bethell, 5: 197-227. 6 vols. Cambridge: Cambridge University Press, 1982-1991. Collin, Richard H. Theodore Roosevelt, Culture, Diplomacy, and Expansion: A New View of American Expansion. Baton Rouge: Louisiana State University Press, 1985. Collin, Richard H. Theodore Roosevelt's Caribbean: The Panama Canal, the Monroe Doctrine, and the Latin American Context. Baton Rouge: Louisiana State University Press, 1990. Connell-Smith, Gordon. The United States and Latin America. New York: John Wiley, 1974. Conniff, Michael L. Black Labor on a White Canal: Panama, 1904-1981. Pittsburg: University of Pittsburg Press, 1985. Crichfield, George W. American Supremacy: The Rise and Progress of the Latin American Republics and Their Relations to the United States. 2 vols. New York: Bretano's, 1908. DeCond, Alexander. Herbert Hoover's Latin American Policy. Stanford: Stanford University Press, 1951. Dunkerley, James. Power in the Isthmus: A Political History of Modern Central America. London: Verso, 1988. Ghiraldo, Alberto. Yanquilandia bárbara: La lucha contra el imperialismo: Historia Nueva. 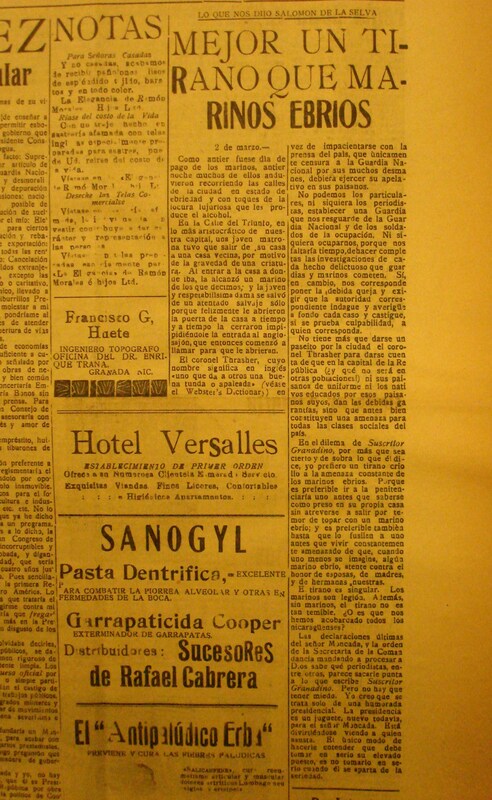 Madrid: Imprenta Argis, 1929. Gómez, Arias. Faribundo Martí . San José: Ed. 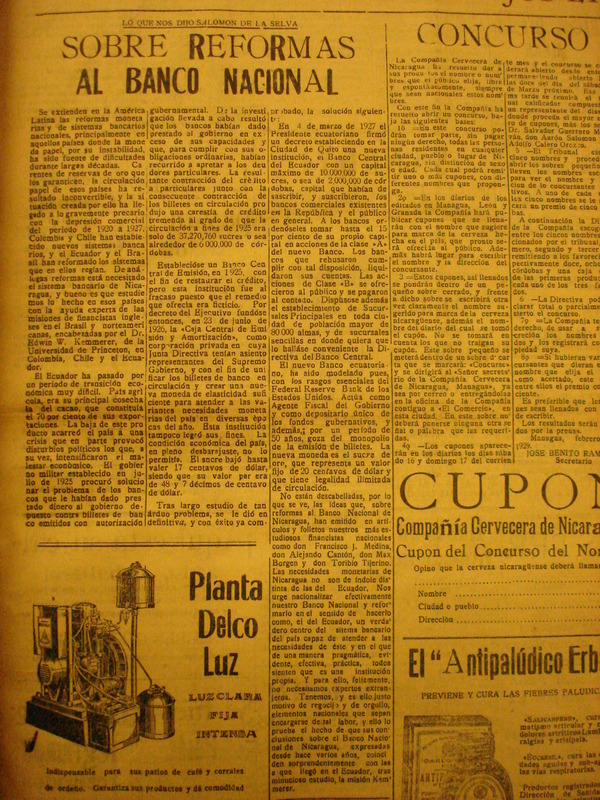 Texto Limitada, 1972. Graham, Richard, ed. The Idea of Race in Latin America, 1870-1940. Austin: University of Texas Press, 1990. Grigul‚vich, Iósif. Luchadores por la libertad en America Latina. Moscow: Progreso, 1958. Gudmundson, Lowell, and Héctor Lindo-Fuentes. Central America, 1821-1871: Liberalism before Liberal Reforms. Tuscaloosa, AL: University of Alabama Press, 1995. Hale, Charles. Liberalism in the Age of Mora, 1821-1853. New Haven: Yale University Press, 1968. Hale, Charles. The Transformation of Liberalism in Late Nineteenth-Century Mexico. Princeton: Princeton University Press, 1989. Handy, Jim. Gift of the Devil: A History of Guatemala. Boston: South End, 1985. Hill, Howard C. Roosevelt and the Caribbean. Chicago: University of Chicago Press, 1927. Hilton, Ronald, ed. Who's Who in Latin America, Part II: Central America and Panama. Stanford: Stanford University Press, 1945. Kidd, Benjamin. The Control of the Tropics. New York: Macmillan, 1898. LaFeber, Walter. Inevitable Revolutions: The United States in Central America. New York: Norton, 1984. Langley, Lester D. The Banana Wars: An Inner History of American Empire. Lexington: University of Kentucky Press, 1983. Langley, Lester D. The United States and the Caribbean in the Twentieth Century. Athens: University of Georgia Press, 1980. MacLeod, Murdo J. Spanish Central America: A Socioeconomic History, 1520-1720. Berkeley: University of California Press, 1973. Mariátegui, José Carlos. Seven Interpretive Essays on Peruvian Reality, trans. by Marjory Urquidi. Austin: University of Texas Press, 1971. McCreery, David. "Debt Servitude in Rural Guatemala, 1876-1936," Hispanic American Historical Review 63 (November 1983): 735-59. Ninkovich, Frank. "Theodore Roosevelt: Civilization as Ideology," Diplomatic History 10 (Summer 1986): 221-45. Munro, Dana. The Five Republics of Central America. Oxford: Oxford University Press, 1918. Pérez-Brignoli, Héctor. A Brief History of Central America. Ricardo B. Sawrey A. and Susana Stettri de Sawrey, trans. Berkeley: University of California Press, 1989. Pérez-Brignoli, Héctor, and Mario Samper, eds. Tierra, café, y sociedad. San José: FLACSO, 1994. Sáenz, Vicente. Rompiendo cadenas: las del imperialismo norteamericano. Mexico: s.p., 1933. Salisbury, Richard V. Anti-Imperialism and International Competition in Central America, 1920-1929. Wilmington, Deleware: SR Books, 1989. Sands, William F. Our Jungle Diplomacy. Chapel Hill: University of North Carolina, 1944. Santos, Rosario. And We Sold the Rain: Contemporary Fiction from Central America. Peterborough, UK: Ryan Publishing Co., 1989. Schmidt, Hans. The United States Occupation of Haiti, 1915-1934. New Brunswick, N.J.: Rutgers University Press, 1977. Stuart, Graham H. Latin America and the United States. New York: The Century Company, 1922. Schoonover, Thomas D. The United States in Central America, 1860-1911: Episodes of Social Imperialism. Durham: Duke University Press, 1991. Schultz, Afred P. Race or Mongrel. Boston: L.C. Page, 1908. Smith, Carol A., ed. Guatemalan Indians and the State, 1540-1988. Austin: University of Texas Press, 1990. Smith, Gavin. Livelihood and Resistance: Peasants and the Politics of Land in Peru. Berkeley: University of California Press, 1989. Tábora, Rocío. Masculinidad y violencia en la cultura política hondureña. Tegucigalpa: Centro de Documentación de Honduras, 1995. Taracena A., Arturo, y Jean Piel, eds. Identidades nacionales y estado moderno en Centroamérica. San José: Universidad de Costa Rica, 1995. Torres Rivas, Edelberto. History and Society in Central America. Douglass Sullivan-González, trans. Austin: University of Texas Press, 1993. Weston, Rubin Francis. Racism in U.S. Imperialism. Columbia: Te University of South Carolina Press, 1972. Williams, Mary W. "Anglo-American Isthmian Diplomacy, 1815-1915." American Historical Review (? ), 1916. Williams, Robert G. Export Agriculture and the Crisis in Central America. Chapel Hill: University of North Carolina Press, 1986. Williams, Robert G. States and Social Evolution: Coffee and the Rise of National States in Central America. Chapel Hill: University of North Carolina Press, 1994? Woodward, Ralph Lee, Jr. Central America: A Nation Divided. 2d. ed. New York: Oxford University Press, 1985. Woodward, Ralph Lee, Jr. "Central America from Independence to c. 1870." In Leslie Bethell, ed., The Cambridge History of Latin America, vol. 3, Cambridge: Cambridge University Press, 1990. Woodward, Ralph Lee, Jr. Rafael Carrera and the Emergence of the Republic of Guatemala, 1821-1871. Athens, GA: University of Georgia Press, 1993. Alegria, Claribel and D.J. Flakoll. Nicaragua: la revolución sandinista. 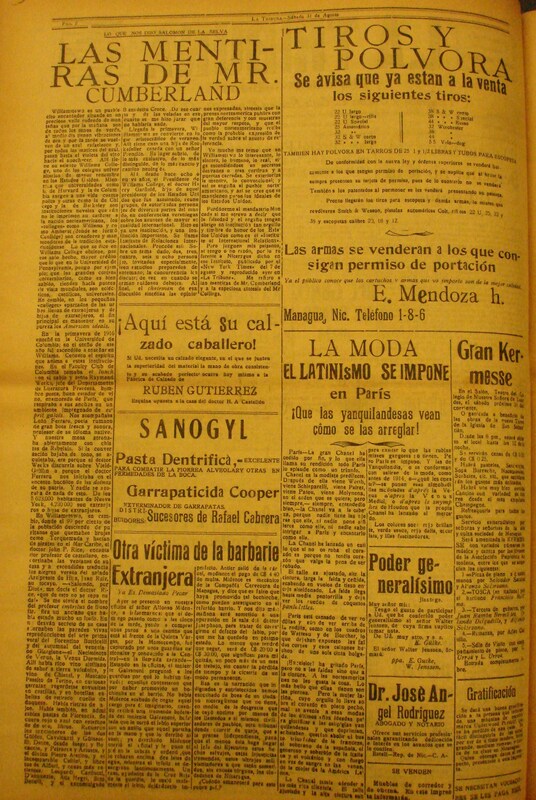 Una crónica política, 1855-1979. Mexico City: Era, 1982. Alvarez, Emilio Lejarza. El Güegüence, comedía-bailete de la época colonial. Managua: Ediciones Distribuidora Cultural, 1992. Amador, Armando. Un siglo de lucha de los trabajadores in Nicaragua (1880-1979). Managua: Fondo Editorial CIRA, 1990. Apuntes de historia de Nicaragua. Managua: Universidad Nacional Autónoma de Nicaragua (UNAN), Departamento de Ciencias Sociales, Sección de Historia, 1976. Aquino, Enrique. La personalidad política del General José Santos Zelaya. Managua, D.N. : s.p., 1944. Arguello, Leonardo. Catecismo político para el pueblo. León, Nicaragua: s.p., 1928. "Army Engineer Explores Nicaragua." National Geographic Magazine 61 (May 1932): 592-627. Belli, Humberto. "Un ensayo de interpretación sobre las luchas políticas nicaraguenses (De la independencia hasta la Revolución Cubana)," Revista del Pensamiento Centroamericano 2, 157 (October-December 1977): 50-59. Belt, Thomas. The Naturalist in Nicaragua. London: Edward Bumpus, 1888. Beverley, John and Marc Zimmerman. Literature and Politics in the Central American Revolutions. Austin: University of Texas Press, 1990. Beull, Raymond Leslie. 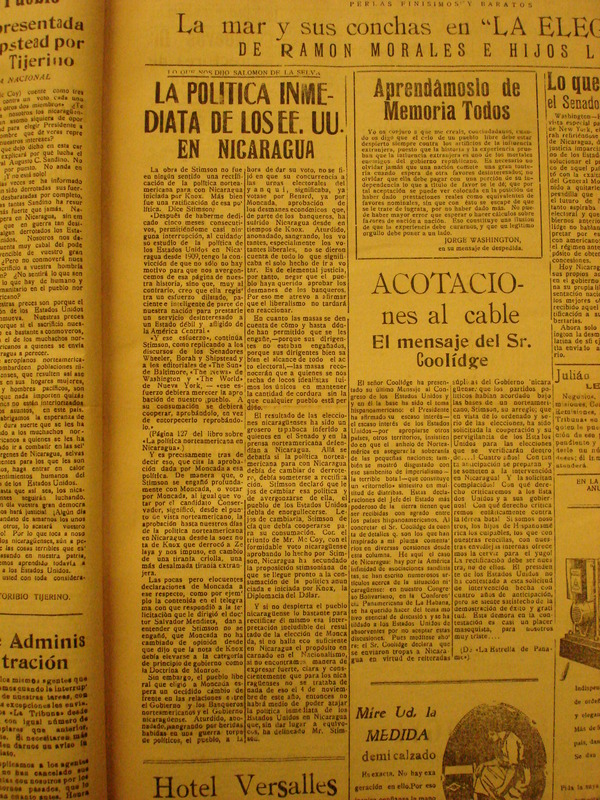 "Reconstruction in Nicaragua," Foreign Policy Association Information Service 6, 18, November 12, 1930. Beull, Raymod Leslie. "Union or Disunion in Central America?" Foreign Affairs 11 (April 1933): 478-489. Biderman, Jaime. "The Development of Capitalism in Nicaragua: A Political Economic History." Latin American Perspectives 36, 1 (Winter 1983): 7-32. Black, George. The Triumph of the People: The Sandinista Revolution in Nicaragua. London: Zed Press, 1981. Booth, John A. The End and the Beginning: The Nicaraguan Revolution. Boulder: Westview Press, 1982. Borge, Tomás, La paciente impaciencia. Managua: Vanguardia, 1989. Brooks, David C. "U.S. Marines, Miskitos, and the Hunt for Sandino: The Río Coco Patrol in 1928." Journal of Latin American Studies 21, 2 (May 1989): 311-42. Bouallius, Carl. Viaje por Centroamerica (1881-1883), trad. del sueco por el Dr. Camilio Vijil Tardón. Managua: Banco de America, 1977. Burns, E. Bradford. Patriarch and Folk: The Emergence of Nicaragua, 1798-1858. Cambridge: Harvard University Press, 1991. Cabarros, Carlos Rafael. "Campesinado y capital monopolista en Nicaragua." Estudios Sociales Centroamericanos 32 (1977): 463-474. Carter, C.B. 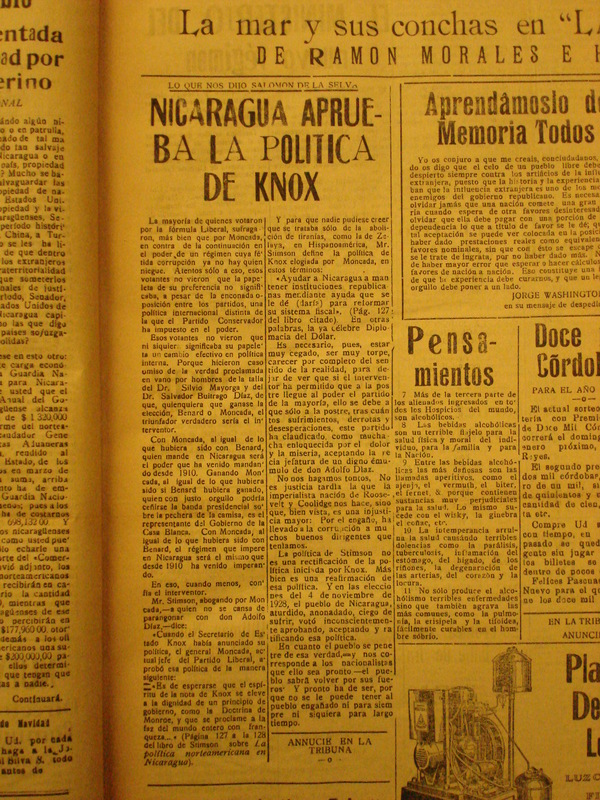 "The Kentucky Feud in Nicaragua." The World's Work 54 (July 1927): 312-321. Castellón, José‚ María. Centenario de Zelaya, 1853-1953. Managua, D.N. 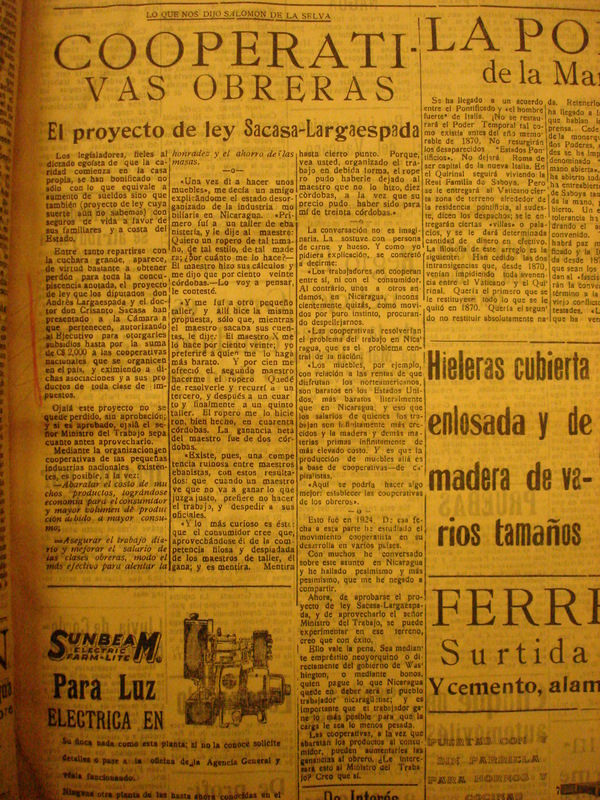 : Tipografía Heuberger, Nov. 1, 1953. Castellón, José‚ María. Actuación del partido Liberal y del partido Conservador en el poder. Managua, 1947. Castro Silva, Juan María. Nicaragua económica. Managua: Talleres Nacionales, 1949. Censo general de la república. Managua: Oficina Central del Censo, 1920. Chamorro, Emiliano. El último caudillo: autobiografía. Managua: Union, 1983. Chamorro Zelaya, Pedro Joaquin. Fruto Chamorro. Reprinted in Revista Conservadora del Pensamiento Centroamericano, vo. 19, no. 91, abril 1968: 1-106. Christian, Shirley. Nicaragua: Revolution in the Family. New York: Vintage, 1986. 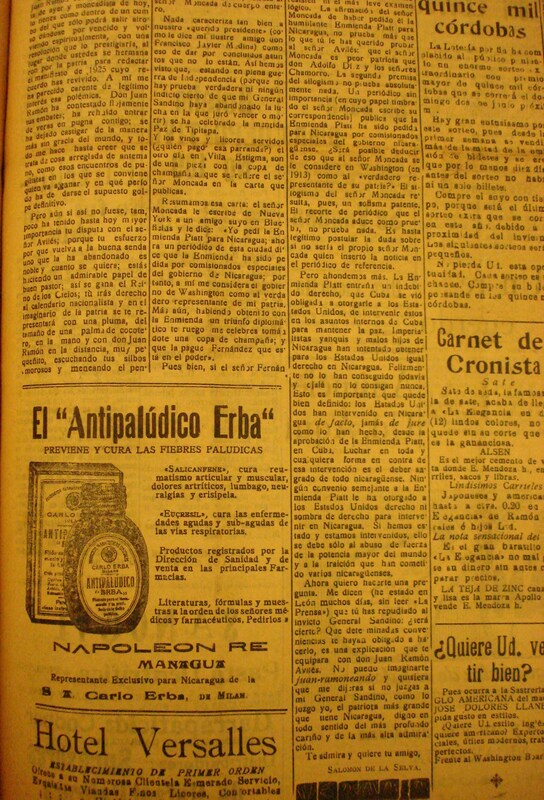 Cincuenta años de la guerra civil Libero-Conservadora, 1926-76. León, Nicaragua: El Centroamericano, 1977. Clayton, Lawrence A. "The Nicaraguan Canal in the Nineteenth Century: Prelude to American Empire in the Caribbean," Journal of Latin American Studies 19 (November 1987): 323-52. Cole Chamorro, Alejandro. 145 años de historia política en Nicaragua. Managua: s.p., 1967. Cole Chamorro, Alejandro. Desde Sandino hasta los Somoza. Managua: s.p., s.f., c.1972. Colindres, Juan. Anastasio Somoza: fin de una estirpe de ladrones y asesinos. Mexico: Posada, 1979. Consejo Nacional de Elecciones, Informes sobre las elecciones de authoridades supremas, 1924 y 1928. República de Nicaragua. 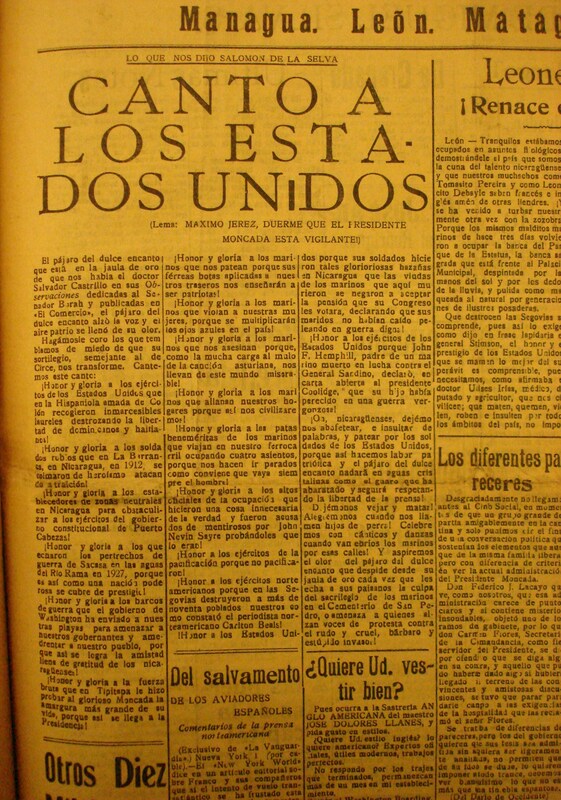 Managua: Tipografía Nacional, 1929. Cortázar, Julio. Nicaragua, tan violentamente dulce. Managua: Nueva Nicaragua, 1983. Cortázar, Julio. Nicaraguan Sketches. Kathleen Weaver, trans. New York: Norton, 1989. Cox, Isaac Joslin. Nicaragua and the United States, 1909-1927. Boston, 1927. Cramer, Floyd. Our Neighbor Nicaragua. New York: F.A. Stockes Co., 1929. Crawley, Eduardo D. Dictators Never Die: A Portrait of Nicaragua and the Somoza Dynasty. New York: St. Martin's Press, 1979. Cuadra Chamorro, Pedro J. Motivos sobre el Tratado Chamorro-Bryan. Managua: Conservador Tradicionalista, 1950. Cuadra Pasos, Carlos. Recognition of Governments, Case of Nicaragua. Washington D.C., 1926. Cuadra Pasos, Carlos. Cabos sueltos en mi memoria. Cuadra Pasos, Carlos. Obras. 2 vols. Managua: Banco de Am‚rica, 1976. Cumberland, W.W. Nicaragua: An Economic and Financial Survey. Washington D.C.: Government Printing Office, 1928. Davis, Peter. Where is Nicaragua? New York: Simon & Schuster, 1987. Deere, Carmen Diana and Peter Marchetti, S.J. "The Worker Peasant Alliance in the First Year of the Nicaraguan Agrarian Reform." Latin American Perspectives 29 (8) 2 (spring 1981): 40-73. Dennis, Lawrence. "Revolution, Recognition and Intervention." Foreign Affairs 9 (January 1931): 204-221. Dennis, Lawrence. "Nicaragua: In Again, Out Again." Foreign Affairs 9 (April 1931): 496-500. Denny, Harold Norman. Dollars for Bullets: The Story of American Rule in Nicaragua. New York: Dial Press, 1929. Dodd Jr., Thomas J. "United States in Nicaraguan Politics: Supervised Elections, 1927-1932." Unpublished Ph.D. dissertation, The George Washington University, Washington D.C., 1966. Doubleday, Charles William. The Filibusters War in Nicaragua. New York, 1886. Dozier, Craig. Nicaragua's Mosquito Coast: The Years of British and American Presence. University: University of Alabama Press, 1985. Espinoza, Rudolfo. Nicaraguan Affairs: Memorial to the U.S. Senate. San José, Costa Rica, 1912. Fernández, Ilva. "Estructura económico, social, y política del regimen de Zelaya." Unpublished ms., Facultades de Humanidades, Escuela de Sociología, Universidad Centroamericana, Managua, 1978. Frazier Jr., Charles E. "The Dawn of Nationalism and its Consequences in Nicaragua." Unpublished Ph.D. dissertation, University of Texas, 1958. Gallich, Manuel. "Nicaragua, 1933-1936: gestación y nacimiento de la dinastía," Casa de Las Americas 20, 117 (nov.-dic. 1979): 65-75. Gámez, José Dolores. Historia de Nicaragua. Managua: El País, 1889. Gámez, José Dolores. Historia moderna de Nicaragua, complemento a mí Historia de Nicaragua. Managua: Banco de America, 1975. Gámez, José Dolores. Registro de propiedad, Nicaragua, Indices. Managua: Ministerio de Instrucción P£blica, s.f. Gobat, Michel. Confronting the American Dream: Nicaragua under U.S. Imperial Rule (Chapel Hill: Duke University Press, 2005). "Gold Mining in Nicaragua." Engineering and Mining Journal 143 (August 1942): 114-115. Gould, Jeffrey. To Lead as Equals: Rural Protest and Political Consciousness in Chinandega, Nicaragua, 1912-1979. Chapel Hill: University of North Carolina Press, 1990. Gould, Jeffrey. "La raza rebelde: las luchas de la comunidad indígena de Subtiava, Nicaragua (1900-1960)." Revista de Historia (Universidad de Costa Rica) 21-22, enero-diciembre 1990: 69-117. Gould, Jeffrey L. "Notes on Peasant Consciousness and Revolutionary Consciousness in Nicaragua, 1955-1990." Radical History Review 48 (1990): 65-87. Gould, Jeffrey L. "El trabajo forzoso y las comunidades indígenas nicaragüenses." Héctor Pérez Brignoli y Mario Samper K., eds., El café en la historia de America Central. San José: FLACSO, 1992. Gould, Jeffrey L. "'Vana Ilusión!' The Highlands Indians and the Myth of Nicaragua Mestiza, 1880-1925." Hispanic American Historical Review 73 (3) August 1993. Greer, Virginia Leonard. "Charles E. Hughes and Nicaragua, 1909-1925," Unpublished Ph.D. Dissertation, 1955. Greer, Virginia Leonard. "State Department Policy in Regard to the Nicaraguan Election of 1924." Hispanic American Historical Review 34, 3 (1954): 445-467. Guerrero C., Julian N. Cacíques heróicos de Centroamérica: rebelión indígena de Matagalpa en 1881, y expulsión de los jesuitas... s.l., s.p., s.f. Guerrero C., Julian N. Monografía de Jinotega. Managua: s.p., 1966. Guerrero C., Julian N. Monografía de Matagalpa. Managua: s.p., 1967. Guevara, Onofre and Carlos Pérez Bermudez. El movimiento obrero en Nicaragua. Managua: Editorial El Amanecer, 1985. Guillén de Herrera, Celia. Nueva Segovia. Telpaneca, Nueva Segovia y León: Hospicio, 1945. Part 1. (PDF file, 13 MB). Part 2 (PDF file, 57 MB). Part 3 (PDF file, 30 MB). Hackett, Charles E. "A Review of Our Policy in Nicaragua." Current History 29 (November 1928): 285-288. Hackett, Charles E. "Rival Governments in Nicaragua." Current History 25 (February 1927): 734-736. Hale, Charles R. Resistance and Contradiction: Miskitu Indians and the Nicaraguan State, 1894-1987. Stanford: Stanford University Press, 1994. Handbook of Nicaragua. International Bureau of the American Republics. Washington D.C.: Government Printing Office, 1896. Hill, Roscoe R. Fiscal Intervention in Nicargua. New York: Paul Maisel Co., 1933. Houwald, Gotz Dieter, Freihher von. Los alemanes en Nicaragua. Managua: Banco de America, Talleres San Jos‚, 1975. Huete Abella, Rodolfo. Los banqueros y la intervención en Nicaragua. Managua: Tipografía Pérez, 1931. Ibarra Narvaez, Joaquin. Ubicación histórica, sociológica e ideológica de los partidos políticos de Nicaragua. León, Nicaragua: n.p., 1961. Incer, Jaime. Geografía ilustrada de Nicaragua. Managua: Libreria y Editorial Recalde, 1973. Instituto de Estudio de Sandinismo. Pensamiento antimperialista en Nicaragua. Managua: Nueva Nicaragua, 1982. Jarquin Calderón, Edmundo. "Notas sobre el desarrollo del capitalismo en la agricultura." Estudios Sociales Centroamericanos 11 (May-August 1975). Jarquin Calderón, Edmundo. "Migraciones rurales y estructura agraria en Nicaragua." Estudios Sociales Centroamericanos 11 (May-August 1975). Jarquín Vallejos, Miguel. La muerte de Cabulla. Colección documentos históricos de El Viejo, 1974. Jenkins Molieri, Jorge. El desafío indígena en Nicaragua: el caso de los miskitos. Managua: Editorial Vanguardia, 1986. José Santos Zelaya: President of Nicaragua. New York: F.J. Dassori, 1906. Juárez, Orient Bolívar. Causas de la creación, supresión, y restablecimiento del departamento de Estelí a fines del siglo XIX. Managua: Centro de Investigaciones Históricas de Nicaragua Adolfo Altamirano C., 1995. Kamman, William. A Search for Stability: United States Diplomacy toward Nicaragua, 1925-1933. Notre Dame: University of Notre Dame Press, 1968. Keasbeay, L. M. The Nicaraguan Canal and the Monroe Doctrine. New York: G.P. Putnam's Sons, 1896. Kinloch Tijerino, Frances. Nicaragua en busca de su identidad. Instituto de Historia de Nicaragua, 1995. Kremlin, William. Nicaragua en la primera mitad del siglo. Managua: Ediciones Populares, 1976. La coalición ante el congreso, el problema electoral de Nicaragua. Managua: n.p., 1920. Laird, Larry Keith. "Technology Versus Tradition: The Modernization of Nicaraguan Agriculture, 1900-1940." Unpublished Ph.D. dissertation, University of Kansas, 1974. Lancaster, Roger N. Thanks to God and the Revolution: Popular Religion and Class Consciousness in the New Nicaragua. Columbia: Columbia University Press, 1988. Lancaster, Roger N. Life is Hard: Machismo, Danger, and the Intimacy of Power in Nicaragua. Berkeley: University of California Press, 1992. Lanuza Matamoros, Alberto. "Estructuras socioeconómicos, poder, y estado en Nicaragua, 1821-1875." Unpublished thesis, Programa Centroamericano de Ciencias Sociales, Universidad de Costa Rica, 1976. Ley de la mesta. Managua: Tipografía Nacional, 1918. Levy, Pablo. Notas geográficas y económicas sobre la República de Nicaragua. Paris: Imprenta Hispanoamerica, 1873. Lucas, D.B. Nicaragua: War of the Filibusters. Richmond, Va. 1896. Manual de formación municipal: Nicaragua. Dirección de Asuntos Municipales y Regionales del Ministro de la Presidencia (DAMUR) y Instituto de Estudios de Administración Local. Madrid: 1986. Marcus, Bruce, ed. Nicaragua: The Sandinista People's Revolution: Speeches by Sandinista Leaders. New York: Pathfinder Press, 1985. Matagalpa, Juan. Sandino, los Somoza, y los nueve comandantes sandinistas. s.l., s.p., s.f. (c. 1984). Meany, A.J. y Max Géndara M. "Guía agrícola de Nicaragua," año 1, no. 1, Managua: s.p., diciembre de 1946. Medina, Alberto. Efemérides Nicaraguense, 1502-1941. 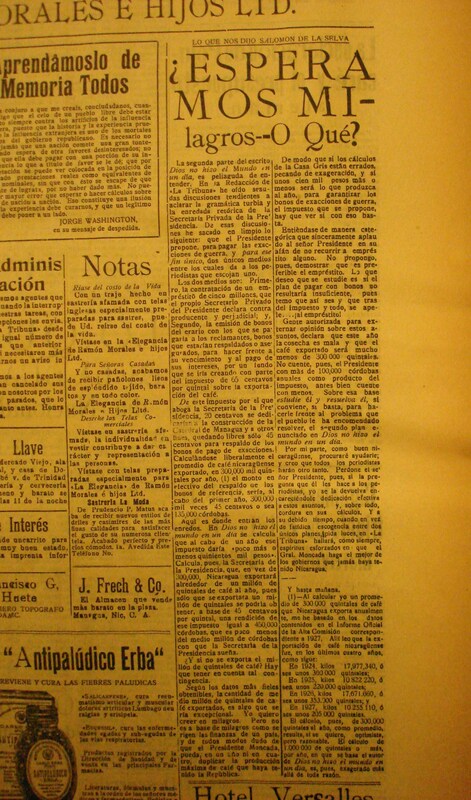 Managua: La Nueva Prensa, 1945. Meditación del honorable Secretario de Estado de los Estados Unidos en la controversia de límites entre la República de Nicaragua y la República de Honduras. Washington D.C.: Gibson Bros., 1920. Miller, Valerie. Between Struggle and Hope: The Nicaraguan Literacy Crusade. Boulder, Colo.: Westview, 1985. Moncada, José‚ María. Lo porvenir. 2a ed. 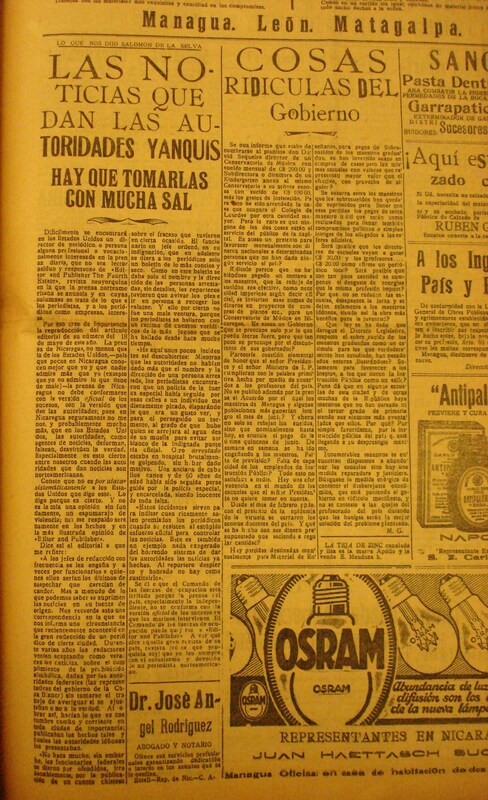 Managua: Tipografía Alemana, 1929. Moncada, José‚ María. El gran ideal. 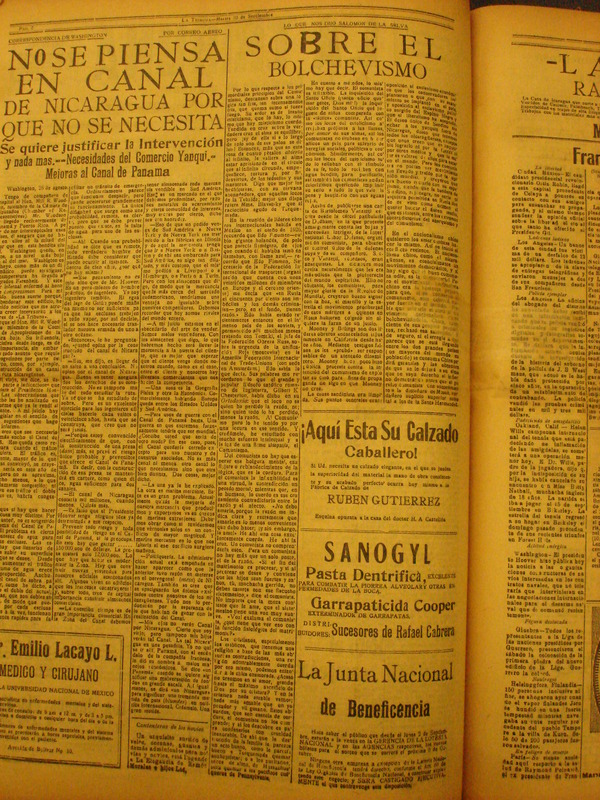 Managua: Imprenta Nacional, 1929. Moncada, José‚ María. Estados Unidos en Nicaragua. Managua: Tipografía Atenas, 1942. Moncada, José‚ María. Nicaragua, sangre en sus montañas. San José, 1985. Mont£far, Lorenzo. Walker en Centro América. Guatemala, 1887. Morales Avilés, Ricardo. Obras. Managua: Editorial Nueva Nicaragua, 1983. Morales, José‚ Joaquín. De la historia de Nicaragua de 1889-1913. Granada, Nicaragua: Magys, 1963. Munro, Dana G. "The Establishment of Peace in Nicaragua." Foreign Affairs 11 (July 1933): 696-705. Murillo, Andrés. Sufragio libre en Nicaragua. 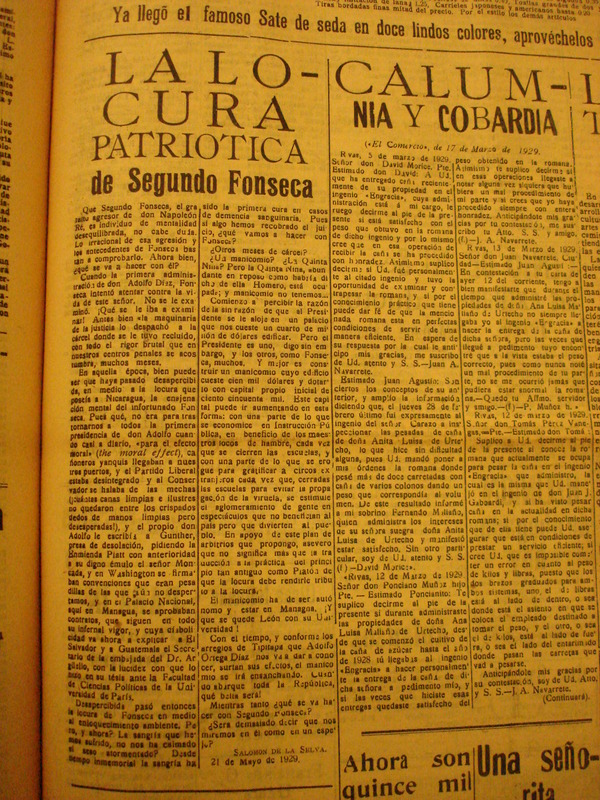 Managua: Tipografía y Encuadernación Nacional, 1924. Muro Rodríguez, Mirtha, et al. Nicaragua y la revolución Sandinista. La Habana: Editorial de Ciencias Sociales, 1984. Newson, Linda A. Indian Survival in Colonial Nicaragua. Norman, OK: University of Oklahoma Press, 1987. Nicaragua. Archivo Nacional. Sección de tierras, 1744 a 1913. Managua: Tipografía Nacional, 1916. Nicaragua, General Descriptive Data. Pan American Union, Washington D.C.: Government Printing Office, 1921. Nicaragua, Long Road to Victory. Moscow: Progress Publications, 1981. The Nicaraguan National Bibliography, 1800-1978. 3 vols. Redlands, California: Latin American Bibliographic Foundation, 1986. Niederlin, Gustavo. The State of Nicaragua in the Greater Republic of Central America. Philadelphia: Philadelphia Commercial Museum, 1898. Nogales, Rafael de. The Looting of Nicaragua. New York: McBride, 1928. Palmer, Mervyn G. Through Unknown Nicaragua. Jarrolds, London, 1945. Penfield, Walter Scott. "Emiliano Chamorro, Nicaragua's Dictator," Current History 24 (June 1926): 345-350. Pérez, Angel María y Ernesto Garahona López. Nicaragua, guía general ilustrada. Managua: Talleres Graficos P‚rez, 1940. Pérez Estrada, Francisco. "Breve historia de la tenencia de la tierra en Nicaragua." 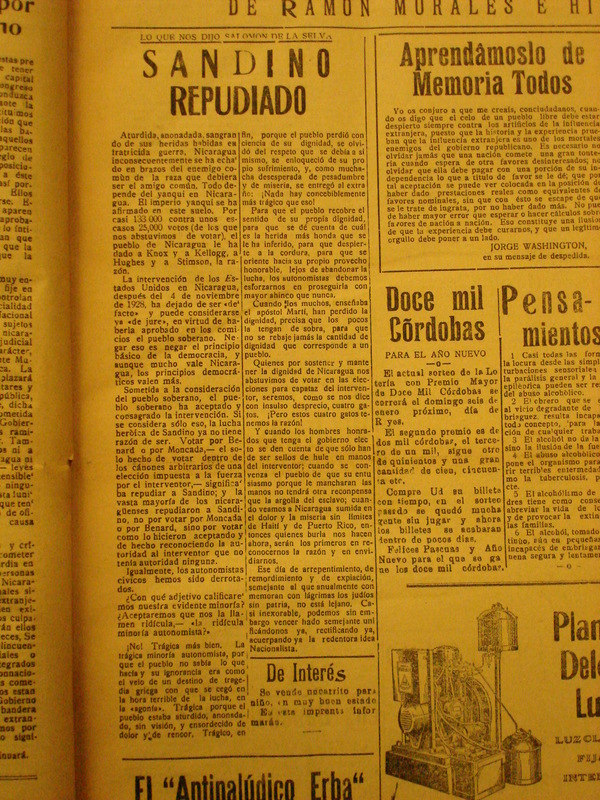 Revista Conservadora del Pensamiento Centroamericano 10, 51 (December 1964): 15-22. Playter, Harold. "Nicaragua, A Commercial and Economic Survey," Trade Promotion Series No. 54, United States Department of Commerce, Bureau of Foreign and Domestic Commerce. Washington D.C.: Government Printing Office, 1927. Porras Mendieta, Nemesio. Formas de tenencia de la tierra y algunos otros aspectos de la actividad agropecuaria. Managua: UNAN, 1962. Quijano, Carlos. Nicaragua: ensayo sobre el imperialismo de los estados unidos (1909-1927). Managua: Editorial Vanguardia, 1987. Radell, David R. "Historical Geography of Western Nicaragua: The Spheres of Influence of Leon, Granada, and Managua, 1519-1965." Unpublished Ph.D. dissertation, University of California, Berkeley, 1969. Ramírez, Sergio. Balcanes y volcanes. Managua: Editorial Nueva Nicaragua, 1983. Real Espinales, Blas. "Din mica de población y estructura agraria en Nicaragua." Estudios Sociales Centroamericanos 9 (September-December 1974): 165-206. Real Espinales, Blas and Marco A. Valle. "Consideraciones sobre la producción del caf‚ y sus incidencias en la estructura agraria en Nicaragua (1900-1945)." Paper presented at the Seminario de Estructura Rural, Universidad de Costa Rica, San Jose, 1975. Real Espinales, Blas and Edmundo Jarquin. "Migración y estructura agraria in Nicaragua." Paper presented at the Programa Centroamericano de Ciencias Sociales, Universidad de Costa Rica, April 13, 1976. La República de Nicaragua. Managua: Tipografía y Encuadernación Internacional, 1906. Reyes Huete, A. Etapas del Ejército. Managua: Talleres Nacionales Sección Militar, 1942. Roberts, Orlando W. Narración de los viajes y excursiones en la costa oriental y el interior de centroamérica, 1827. Managua: Banco de América, 1978. Romero Vargas, Germán. Las estructuras sociales de Nicaragua en el siglo XVIII. 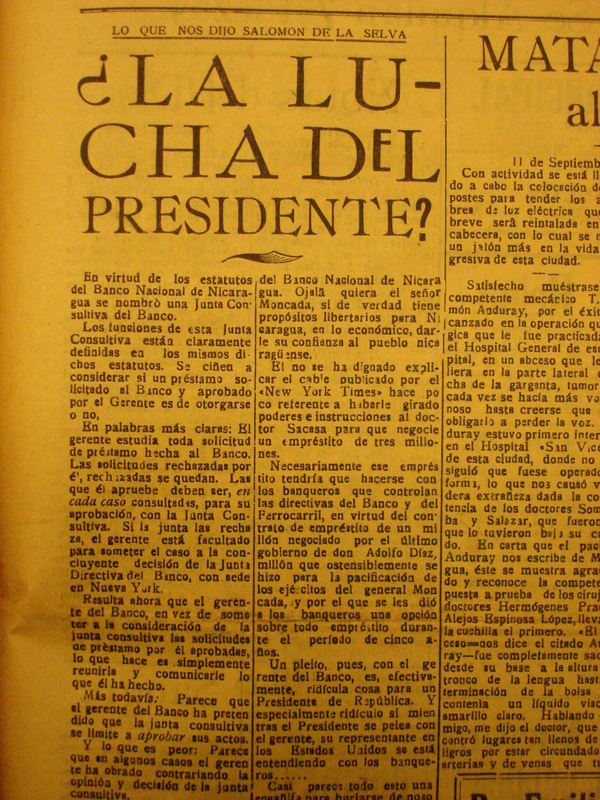 Managua: Editorial Vanguardia, 1976. Sacasa, Juan B. Cómo y por qué caí del poder. 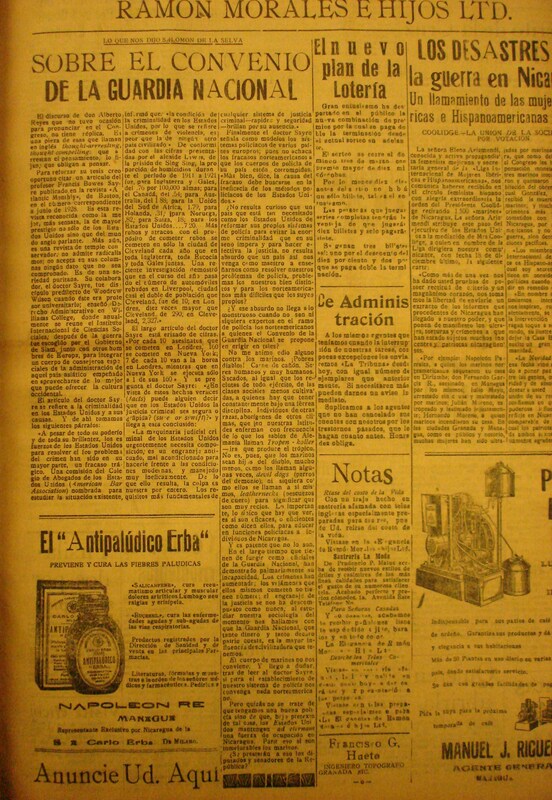 2a edición, Leon: 1946. Reprinted in Revista del Pensamiento Centroamericano 23, 161: October-December 1978. Salvatierra, Sofonías. Obrerismo y nacionalidad. Managua: Tipografía Progreso, 1928. Selva, Adán. Lodo y ceniza de una política que ha podrido las raíces de la nacionalidad nicaragüense. Managua: ASEL, 1960. Selva, Carlos. Un poco de historia, últimos días de la administración del Roberto Sacasa y principios del gobierno del General José Santos Zelaya. Guatemala City: Ediciones del Gobierno de Guatemala, 1948. Squier, Ephraim G. Nicaragua, its People, Scenery, Monuments, and the Proposed Canal. 2 vols. New York, 1852. Stanislawski, Dan I. "The Transformation of Nicaragua, 1519-1548." Unpublished Ph.D. dissertation, University of California, Berkeley, 1983. Stansifer, Charles L. "José Santos Zelaya: A New Look at Nicaragua's 'Liberal' Dictator." Revista/Review Interamericana 7 (Fall 1977): 469-71. Stimson, Henry L. American Policy in Nicaragua. New York: Charles Scribner & Sons, 1927. Stimson, Henry L. and McGeorge Bundy. In Active Service in Peace and War. New York: Charles Scribner & Sons, 1948. Stout, Peter F. Nicaragua, Past, Present, and Future. Philadelphia, 1859. Tapía Barquero, Humberto. Nicaragua, maíz y folklore. Managua: Paperlera Industrial de Nicaragua, 1981. Thompson, Charles A. "The Caribbean Situation: Nicaragua and El Salvador." Foreign Policy Reports 9 (August 30, 1933). Tijerino, Toribio. Reminiscencias históricas. Revista Conservadora del Pensamiento Centroamericano, vol. 8, no. 40, 1963?.. Toledo Ortiz, Alberto, ed. Grandes reportajes históricos de Nicaragua: lo que ocurrió hace 40, 30, 20, 10, 5 años. Managua: s.p., s.f., c.1970. Torres Rivas, Edelberto. Crisis del poder en centroamérica. San José‚: EDUCA, 1989. United States Department of Commerce, Bureau of Foreign and Domestic Commerce, "Trade Directory of Central America and the West Indies," Miscellaneous Series, 22, Washington D.C.: Government Printing Office, 1915. United States Department of Commerce, Bureau of Foreign and Domestic Commerce, "Nicaragua: A Review of Commerce and Industry," Trade Information Bulletin 255. Washington D.C.: Government Printing Office, 1924. United States Department of Commerce, Bureau of Foreign and Domestic Commerce, "Foreign Trade of Nicaragua," Foreign Trade Series, 132 (1933), and Foreign Trade Series, 146 (1934). Washington D.C.: Government Printing Office, 1933, 1934. United States Department of State. Affairs with Nicaragua. Washington D.C: Government Printing Office, 1928. United States Department of State. A Brief History of the Relations Between the United States and Nicaragua, 1909-1928. Washington D.C.: Government Printing Office, 1928. United States Department of State. The United States and Nicaragua: A Survey of the Relations from 1909 to 1932. Washington: Government Printing Office, 1932. United States Department of State. Papers Relating to the Foreign Relations of the United States, 1926-1934. Washington D.C.: Government Printing Office, 1941-1949. United States House of Representatives. "Hearings Before the House Committee on Foreign Affairs Regarding Conditions in Nicaragua and Mexico on January 12, 13, 28, and February 1, 1927," Government Printing Office, Washington D.C., 1927. United States Marine Corps. The United States Marines in Nicaragua. Washington D.C.: Historical Branch, G-3 Division Headquarters, U.S. Marine Corps, Government Printing Office, reprinted in 1968. United States Senate. Use of the United States Navy in Nicaragua: Hearings before the Committee on Foreign Relations. Washington D.C.: Government Printing Office, 1928. Vannini, Margarita, ed. Encuentros con la historia. Managua: Instituto de Historia de Nicaragua, 1995. Vargas, Oscar René. "Hacía una reinterpretación de la historia de Nicaragua." Managua: Nuevo Amanecer Cultural, supplement to Nuevo Diario, August 19, 1984a. Vargas, Oscar René. La intervención norteamericana y sus consequencias, Nicaragua 1910-1925. Managua: DILESA, 1989. Vargas, Oscar René. La revolución que inició el progreso. Managua: CONSA, 1990. Vilas, Carlos M. The Sandinista Revolution: National Liberation and Social Transformation in Central America. New York: Monthly Review Press, 1986. Vilas, Carlos M. Del colonialismo a la autonomía: modernización capitalista y revolución social en la costa atlántica. Nicaragua: Editorial Nueva Nicaragua, 1990. Walker, Thomas W. Nicaragua: Land of Sandino. Boulder: Westview Press, 1981. Walter, Knut. The Regime of Anasasio Somoza, 1936-1956. Chapel Hill: University of North Carolina Press, 1993. Wallace, Mike. "Interview with Nicaraguan Historians." Radical History Review 33 (September 1985): 7-20. Weber, Henri. Nicaragua: The Sandinist Revolution. London: New Left Books, 1981. Weitzel, George T. "American Policy in Nicaragua." Senate Document No. 334, 64th Congress, First Session. Government Printing Office, 1916. Wheelock Roman, Jaime. Imperialismo y dictadura. Managua: Editorial Nueva Nicaragua, 1985a. Wheelock Roman, Jaime. Raíces indígenas de la lucha anticolonialista en Nicaragua: de Gil González a Joaquín Zavala (1523 a 1881). Managua: Editorial Nueva Nicaragua, 1985b. Whisnant, David E. "Rubén Darío as a Focal Cultural Figure in Nicaragua: The Ideological Uses of Cultural Capital." Latin American Research Review 27 (3) 1992: 7-49. Whisnant, David E. Rascally Signs in Sacred Places: The Politics of Culture in Nicaragua. Chapel Hill: University of North Carolina Press, 1995. Zelaya, José Santos. La revolución de Nicaragua y los Estados Unidos. 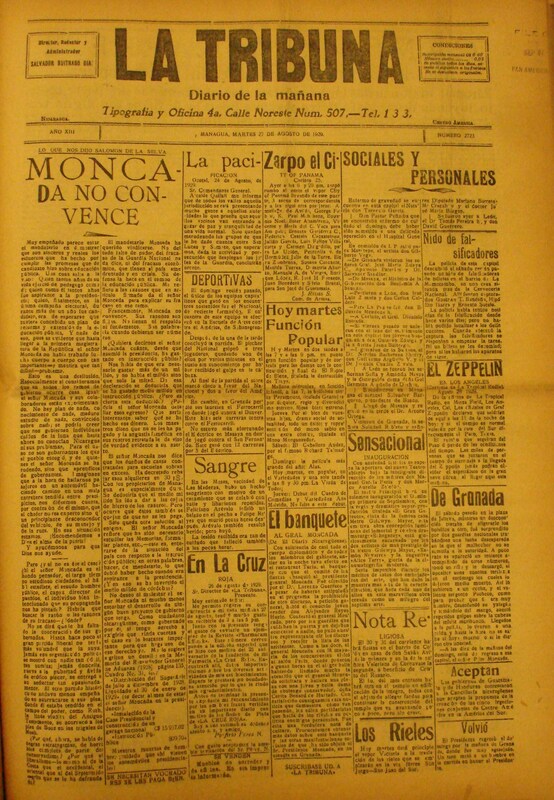 Madrid: Imprenta de Bernardo Rodríguez, 1910. Zelaya, José Santos. Refutation of the Statements of President Taft. Paris: Waltener, 1911. Zeledón R., Benjamín F. Manual científico del arte de la guerra: consejos y ensenanzas de los más grandes capitanes. Managua: Matagalpa: Tipografía de Daniel Olivas, 1932. Acevedo, Antonio. Sandino y Sandinismo. Managua: Editorial Nueva Nicaragua, 1980. Amador, Armando. El exilo y las banderas de Nicaragua. México: Federación Editorial Mexicana, 1987a. Amador, Armando. Sandino y la derrota militar de Estados Unidos en Nicaragua. México: Federación Editorial Mexicana, 1987b. Arauz, Alejandro. "Independencia política y económica en la lucha antimperialista de Sandino." Ponencias 1 (1985). Arce, Bayardo. "Nicaragua Sandinista ante la crisis internacional." Ponencias 2 (1985). Arellano, Jorge Eduardo. Sandino: Iconografía básica. Managua: BCN, 1979. Arellano, Jorge Eduardo. Augusto Cesar Sandino: Escritos literarios y documentos desconocidos. Managua: Ministerio de Cultura, 1980. Arellano, Jorge Eduardo. Sandino en la plástica de América. León, Nicaragua: Editorial Universitaria, 1981. Arellano, Jorge Eduardo. Lecciones de Sandino. Managua: Distribuidora Cultural, 1983. Arellano, Jorge Eduardo. Guerrillero de Nuestra América: Augusto C. Sandino (1895-1934). Managua: HISPAMER, 2008. Baylen, Joseph O. "Sandino: Patriot or Bandit?" Hispanic American Historical Review (August 1951): 394-419. Beals, Carleton. Banana Gold. Philadelphia: Lippincott, 1932. Beals, Carleton. Great Guerrilla Warriors. New Jersey: Prentice Hall, 1970. Bendaña, Alejandro. La mística de Sandino. Managua: Centro de Estudios Internacionales, 1994. 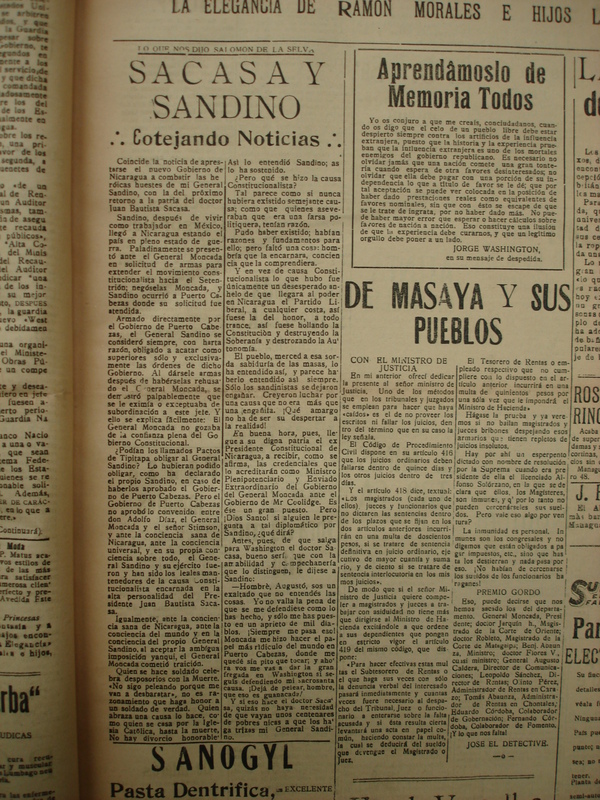 "Biografía de Sandino." Managua: Central Sandinista de Trabajadores, 1982. Bolaños, Gustavo Aleman. El país y los irredentos. 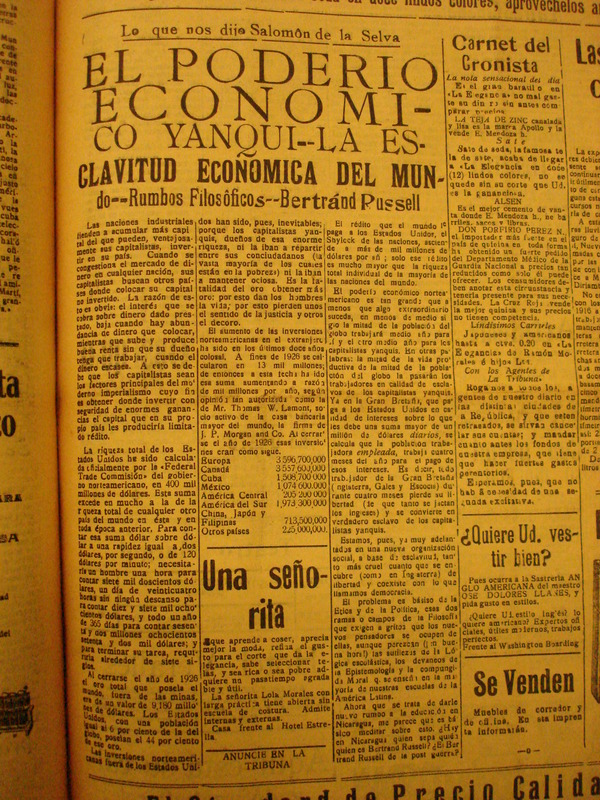 Mexico y Buenos Aires: Imprenta La República, 1927. Bolaños, Gustavo Aleman. ¡Sandino! Estudio completo del héroe de las Segovias. México: Imprenta La Republica, 1932. Bolaños, Gustavo Aleman. Sandino: El libertador, el epopeya, la paz, el invasor, la muerte. Mexico: Ediciones del Caribe, 1980 (orig. 1932). Campos Ponce, Xavier. Los yanquis y Sandino. Mexico: Ediciones X.C.P., 1962. Cancino Troncoso, Hugo. Las raíces históricas e ideológicas del movimiento sandinista. Managua: Odense. 1984. Castillo Ibarra, Carlos. Los Judas de Sandino: 11 aniversario del asesinato del libertador gral. Augusto César Sandino. Mexico, D.F., 1945. Cerdas, Rodolfo. Sandino y el APRA. n.p., n.d., c. 1976. Conrad, Robert E. Sandino: The Testimony of a Nicaraguan Patriot, 1921-1934. Princeton: Princeton University Press, 1990. Crad, Joseph (pseud. Edward C. Trelawney-Ansell). I Had Nine Lives, Fighting for Cash in Mexico and Nicaragua. London: Sampson Low, Marson and Co., 1941. Cruz Alfaro, Ernesto. 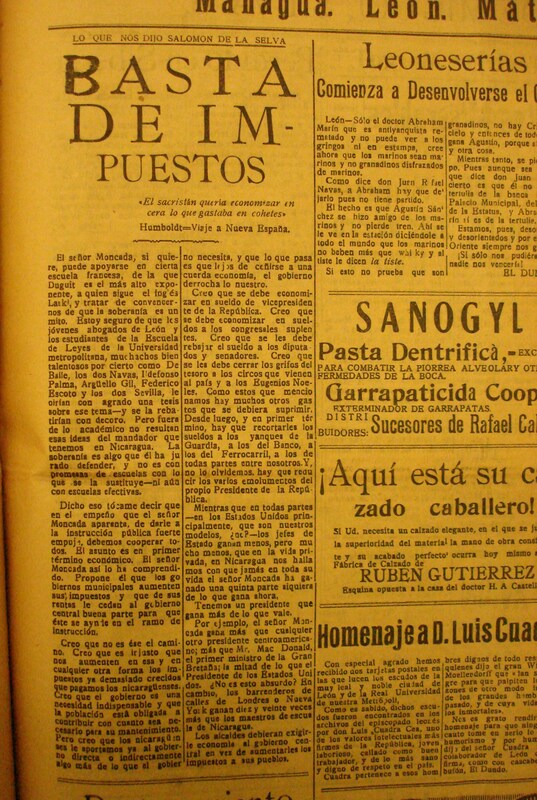 "El pensamiento politico de Sandino." Eco San Salvador (February-March, 1975): 95-114. Cummings, Lejeune. Quijote on a Burro. Mexico: La Impresora Azteca, 1958. Davis, Burke. Marine! The Life of Lieutenant General Lewis B. (Chesty) Puller. Boston: Little, Brown, 1962. Detrinidad Martinez, Jorge, ed. Antología bibliografía: Sandino, el rebelde de América. 2a ed. Managua: Editorial Unión, 1979. Dospital, Michelle. Siempre más allá ... El movimiento sandinista en Nicaragua, 1927-1934. Managua: Instituto de Historia de Nicaragua, 1996. Escobar, José Benito. Ideario Sandinista. Managua: Centro de Publicaciones "Silvio Mayorga," 1984. Fonseca Amador, Carlos. Obras. 2 vols. Managua: Editorial Nueva Nicaragua, 1985. Galeano, Eduardo. Ventana sobre Sandino. s.l. : Ediciones Raití, 1985. Gilbert, Dennis. Sandinistas: The Party and the Revolution. New York: Basil Blackwell, 1988. Grossman, Richard. "La guerra de los marinos contra Las Segovias." Managua: Nuevo Amanecer Cultural, supplement to Nuevo Diario, 22 September 1990. Grossman, Richard. "'Hermanos en la patria': Nacionalism, Honor, and Rebellion: Augusto Sandino and the Army in Defense of the National Sovereignty of Nicaragua, 1927-1934." Unpublished Ph.D. dissertation, University of Chicago, 3 vols., 1996. Guardian Guerrero, Francisco. La última noche del general Sandino. 2a ed. Managua: Rapidograph, 1980. Heinl Jr., Robert D. Soldiers of the Sea: The United States Marine Corps. Annapolis: United States Naval Institute, 1962. Hill, Roscoe H. "Los marinos en Nicaragua." 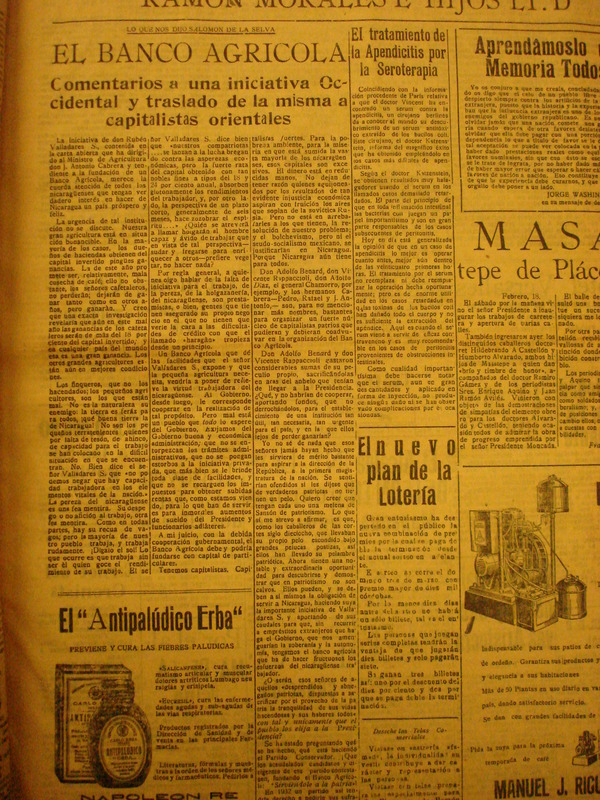 Revista de Pensamiento Centroamericano 27, 135 (December 1971): 2-11. Hodges, Donald C. Sandino's Communism: Spiritual Politics for the Twenty-First Century. Austin: University of Texas Press, 1992. Instituto de Estudio de Sandinismo. El Sandinismo: Documentos básicos. Managua: Editorial Nueva Nicaragua, 1985. Instituto de Estudio de Sandinismo. General Augusto C. Sandino: Padre de la revolución popular y antimperialista, 1895-1934. 2a ed. Managua: Editorial Nueva Nicaragua, 1986b. Literary Digest. "Sandino of Nicaragua: Bandit or Patriot?" February 4, 1928: 46. Macaulay, Neill. "Sandino and the Marines." Unpublished Ph.D. dissertation, University of Texas, 1965. Macaulay, Neill. The Sandino Affair. North Carolina: Duke University Press, 1985. Maraboto, Emigdio. Sandino ante el coloso. 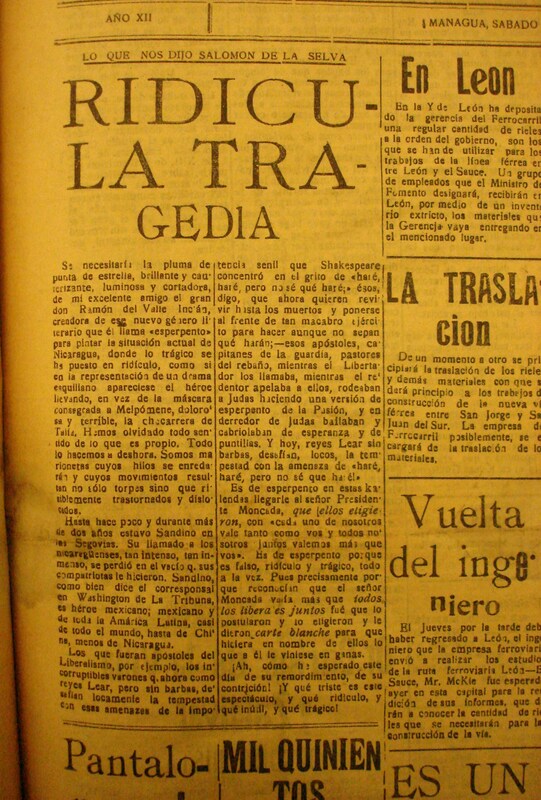 Mexico: Editorial Vera Cruz, 1929. Megee, General Vernon E. "United States Military Intervention in Nicaragua." Unpublished master’s thesis, University of Texas, 1963. Metcalf, Clyde H. A History of the United States Marine Corps. New York: G. Putnam's Sons, 1939. Millett, Richard. Guardians of the Dynasty: A History of the U.S. Created Guardia Nacional of Nicaragua and the Somoza Family. New York: Orbis Books, 1979. Murphy, Jack. History of the U.S. Marines. Greenwich, Conn.: Exeter Books, 1984. Mora Lomeli, Raul H. "Pensamiento de Sandino ante la religión de su tiempo." Encuentro 22 (December 1984): 43-58. Ortega Saavedra, Daniel. El Sandinismo: El más alto grado de organización del pueblo. Managua: Editorial Nueva Nicaragua, 1987. Ortega Saavedra, Humberto. Cincuenta años de lucha sandinista. Mexico: Editorial Diogenes, 1979. Pérez Valle, Eduardo. El asesinato de Sandino. Managua: Ministerio de Cultura, 1986. Ponce, Xavier Campos. Los yanquis y Sandino. Mexico: Ediciones X.C.P., 1962. Price, James L., with Samuel Duff McCoy. The Autobiography of James L. Price, Jungle Jim. New York: Doubleday Doran, 1941. Retratos del General Sandino. s.l., s.p., s.f. Rivera Siles, José Santos, comp. Retratos de Sandino. Managua: Ministerio de Educación, 1981. Robleto Siles, José Antonio. Yo deserté de la Guardia Nacional de Nicaragua. s.l., s.p., 1979. Román, José. Maldito país. Managua: Editorial Unión, 1983. Romero, Ramón. Somoza, asesino de Sandino. Mexico: Patria y Libertad, 1959. Romero, Ramón. Sandino y los yanquis. México: Patria y Libertad, 1961. Sandino enfrenta al imperialismo. Managua: Nueva Nicaragua, 1981. "!Sandino!" Managua: Nuevo Amanecer Cultural, supplement to Nuevo Diario, February 17, 1985. Schroeder, Michael J. "'To Defend Our Nation's Honor:' Toward a Social and Cultural History of the Sandino Rebellion in Nicaragua, 1927-1934." Unpublished Ph.D. Dissertation, University of Michigan, 1993. Schroeder, Michael J. "Horse Thieves to Rebels to Dogs: Political Gang Violence and the State in the Western Segovias, Nicaragua, in the Time of Sandino, 1927-1934," Journal of Latin American Studies 28 (2) May, pp. 383-434. Schroeder, Michael J. "The Sandino Rebellion Revisited: Civil War, Imperialism, Popular Nationalism, and State Formation Muddied Up Together in the Segovias of Nicaragua, 1926-1934." In Gilbert Joseph, Catherine LeGrand, and Ricardo Salvatore, eds., Close Encounters of Empire: Writing the Cultural History of U.S.- Latin American Relations. Durham: Duke University Press, 1998. Schroeder, Michael J. 2007. "Social Memory and Tactical Doctrine: The Air War during the Sandino Rebellion in Nicaragua, 1927-1932." International History Review, 29, September (2007): 508-549. Selser, Gregorio. Sandino, general de hombres libres. 2 vols. Buenos Aires: T.I. Ed. Triángulo, 1959. Selser, Gregorio. Sandino: General of the Free, trans. by Cedric Belfrage. New York: Monthly Review Press, 1981. Selser, Gregorio. El pequeño ejército loco: Sandino y la operación México-Nicaragua. Managua: Editorial Nueva Nicaragua, 1986. Selva, Salomón de la. "Sandino." The Nation, CXXVI, Jan. 18, 1928. Selva, Salomón de la. "La intervención norteamericana en Nicaragua y el general Sandino." Nicaragua, Boletín del archivo general de la nación (January-June), Managua, 1981. Selva, Salomón de la. "Sandino: Free Country or Death." Managua: s.p., 1984. 1. “Sandino repudiado,” 1 de enero. 2. “Nicaragua aprueba la Política de Knox,” 2 de enero. 3. “La política inmediata de los EE. UU. en Nicaragua,” 5 de enero. 4. 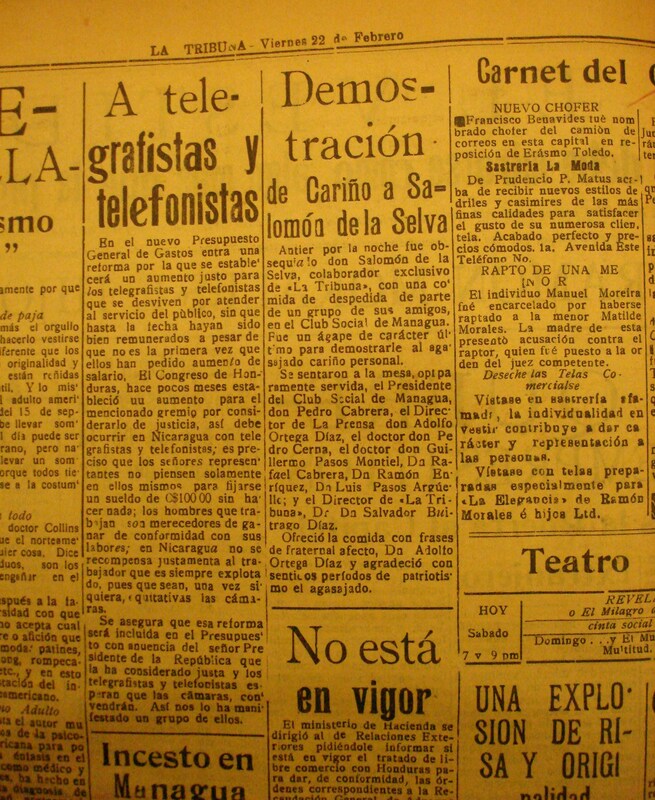 “Sacasa y Sandino – cotejando noticias,” 10 de enero. 5. 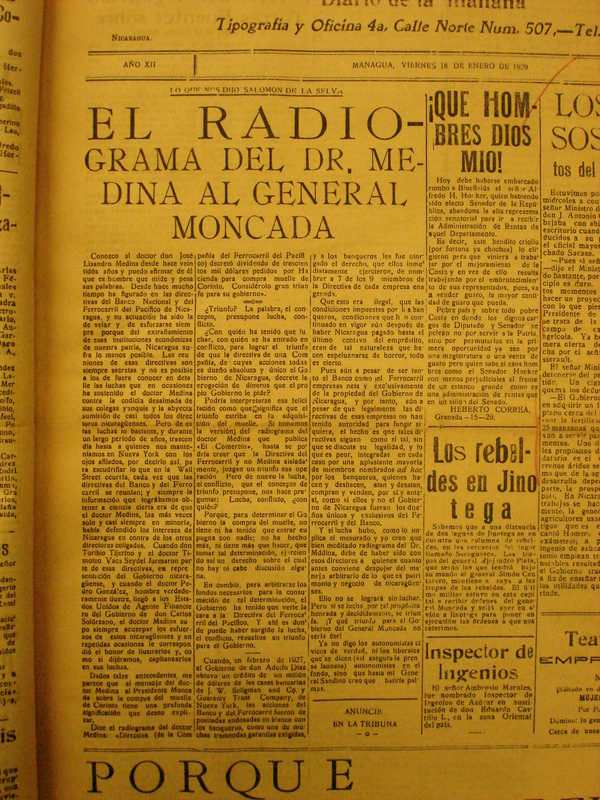 “El radiograma del Mr. Medina al General Moncada,” 18 de enero. 6. “¿Esperamos milagros – o qué?,” 7 de febrero. 7. “Consejo útil,” 16 de febrero. 8. “Sobre reformas al Banco Nacional,” 17 de febrero. 9. “Sobre el Convenio de la Guardia Nacional,” 19 de febrero. 10. “El Banco Agrícola,” 21 de febrero. 11. 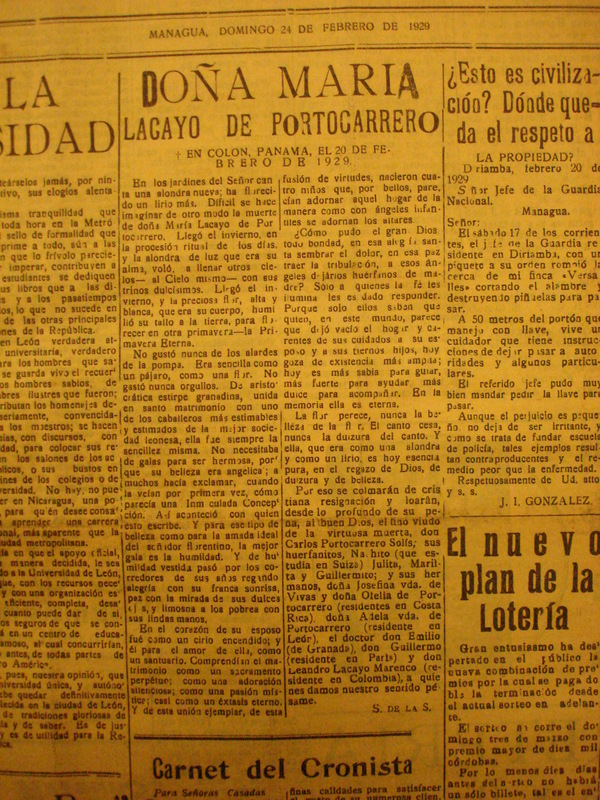 “Doña María Lacayo de Portocarrero,” 24 de febrero. 12. “Cooperativas Obreras – el proyecto de Ley Sacasa-Largaespada,” 26 de febrero. 13. “Mejor un tírano que Marinos ebrios,” 5 de marzo. 14. “Con don Adolfo Ortega Díaz,” 15 de mayo. 15. “Parece que la Enmienda Platt la pidió Díaz antes Moncada,” 17 de mayo. 16. 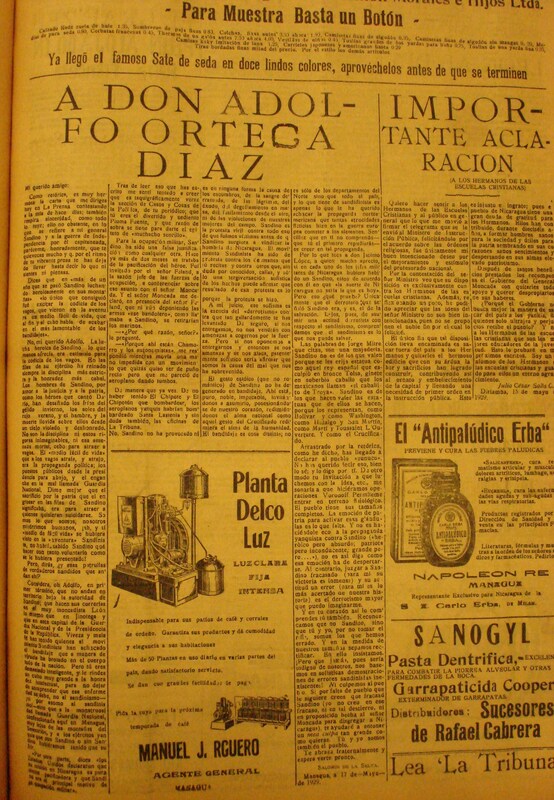 “A don Adolfo Ortega Díaz,” 19 de mayo. 17. “La locura patriótica de Segundo Fonseca,” 24 de mayo. 18. “El poderio económico Yanquí – la esclavitud económica del mundo – rumbos filosóficos,” 11 de junio. 19. 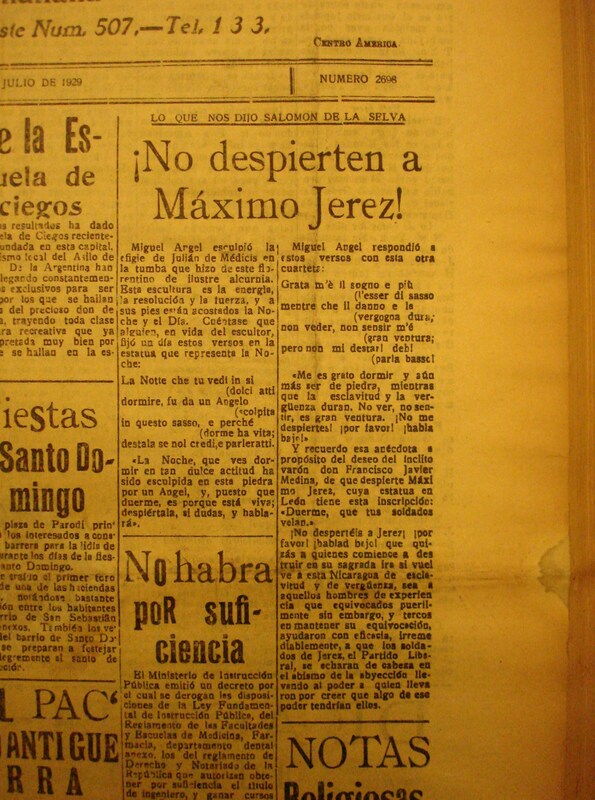 “¡No despierten a Máximo Jérez!”, 26 de julio. 20. “Ridícula tragedia,” 27 de julio. 21. “Nombre, lugar y fecha,” 31 de julio. 22. 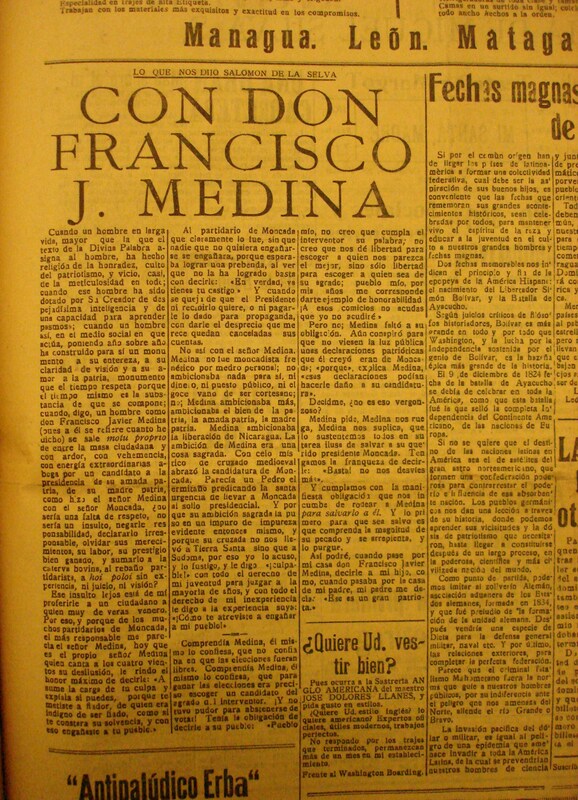 “Con don Francisco J. Medina,” 10 de agosto. 23. “Canto a los Estados Unidos,” 17 de agosto. 24. “Las noticias que dan las autoridades yanquis hay que tomarlas con mucha sal,” 21 de agosto. 25. “Basta de impuestos,” 22 de agosto. 26. “Paul Souday,” 23 de agosto. 27. 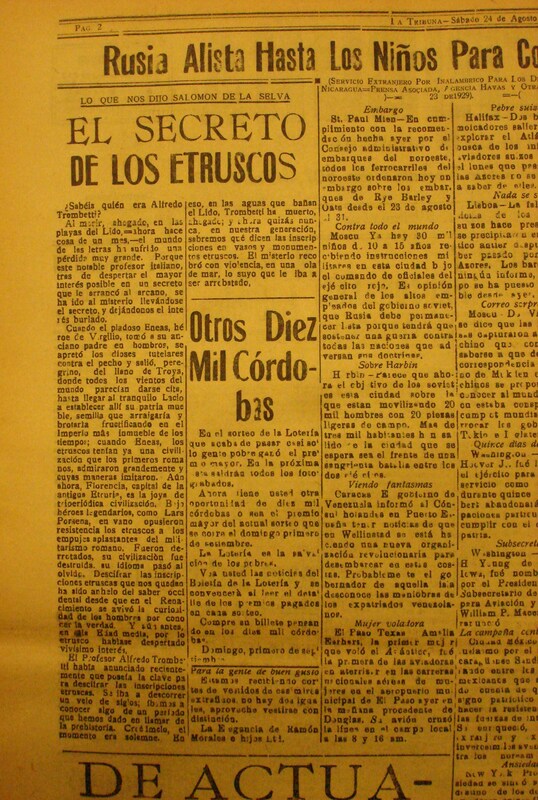 “El secreto de los Etruscos,” 24 de agosto. 28. 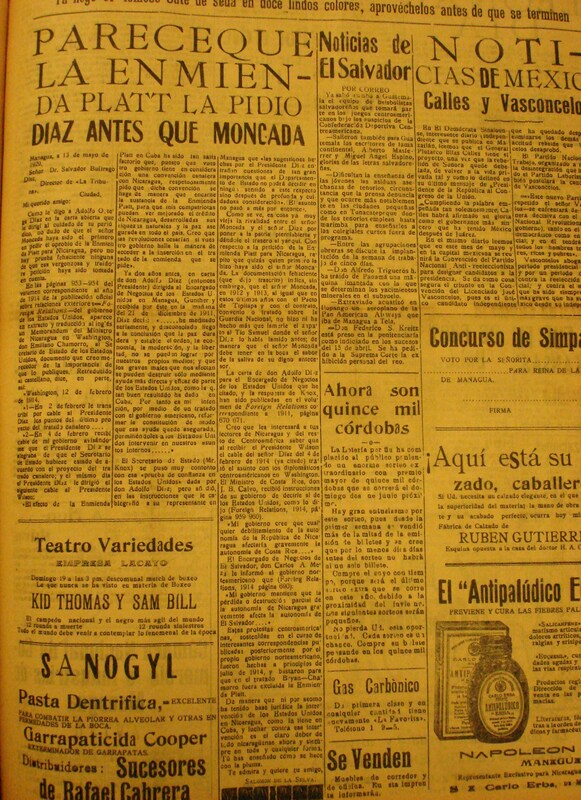 “Moncada no convence,” 27 de agosto. 29. “Las mentiras de Mr. Cumberland,” 31 de agosto. 30. 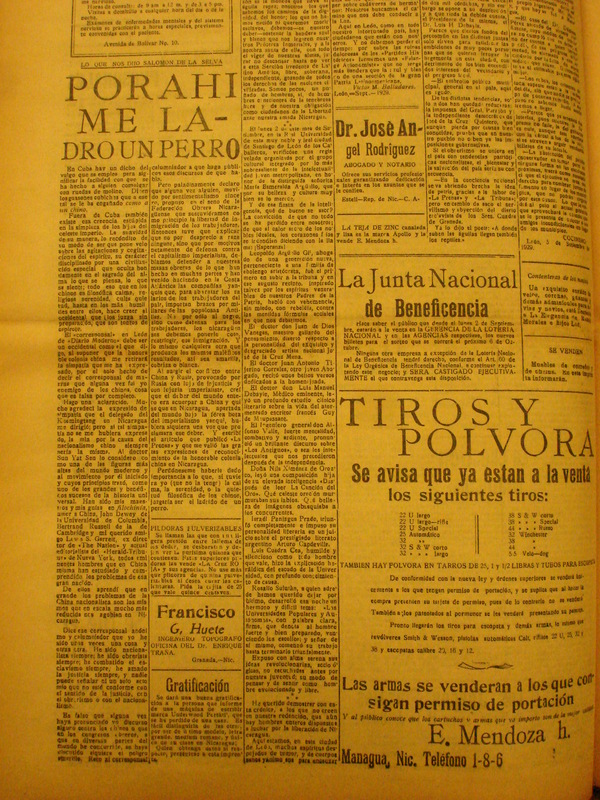 “Por ahí ladro un perro,” 8 de septiembre. 31. “Sobre el Bolchevismo,” 10 de septiembre. 32. “¿La lucha del presidente?” 17 de septiembre. • “Demonstración de cariño a Salomón de la Selva,” 22 de febrero. 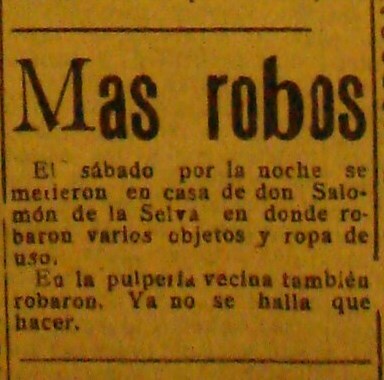 • “Más robos,” 28 de mayo (su casa robado). Siefring, Thomas A. History of the United States Marines. London: Bison Books, 1979. Simmons, Edwin. The United States Marines, 1775-1975. New York: Viking, 1974. Smith, Julian C, et al. "A Review of the Organization and Operations of the Guardia Nacional de Nicaragua." Unpublished manuscript, Personal Papers Collection, Marine Corps Research Center, Quantico VA. Entire text accessible in PDF file (32 MB). Thomas, Lowell. Old Gimlet Eye. New York: Farrar & Rinehart, 1933. Torres Rivas, Edelberto. 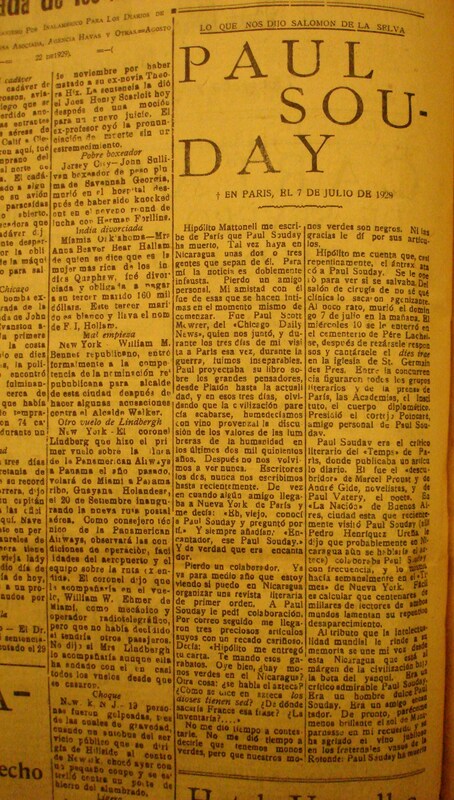 Augusto C. Sandino: Forjadores del mundo moderno. 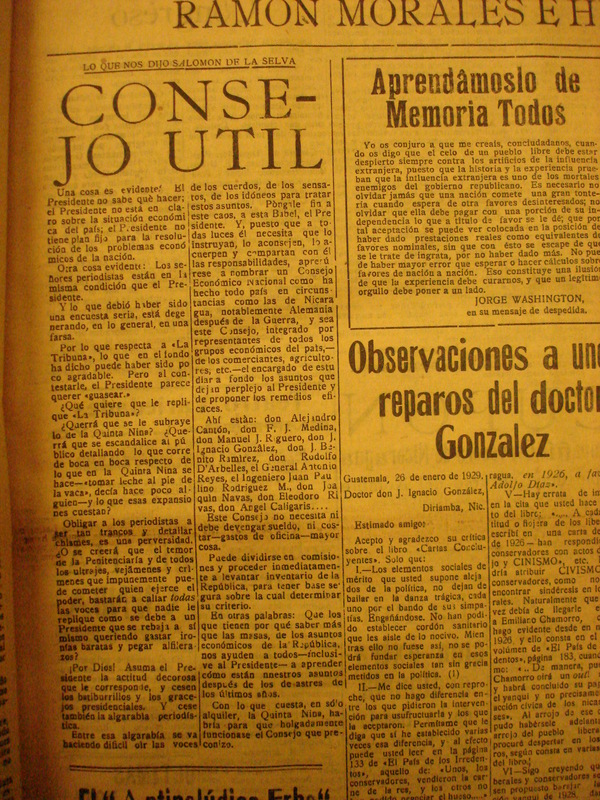 Mexico: Editorial Grijalbo, 1961. Torres Rivas, Edelberto. Sandino y sus pares. Managua: Nuevo Editorial Nicaragua, 1983. Vargas, Oscar-René. "Sandino ante la crisis." Ponencias, 1, 1985. Vargas, Oscar-René. "Movimiento obrero y la lucha de Sandino." Managua: Nuevo Amanecer Cultural, supplement to Nuevo Diario, April 27, 1985. Vargas, Oscar-René. "Movimiento de Sandino: su victoria en la derrota." Managua: Nuevo Amanecer Cultural, supplement to Nuevo Diario, Oct. 11, 1986. Vargasm Iscar-René. Sandino: Floreció al filo de la espada: el movimiento de Sandino, 1926-1939. Managua: Centro de Estudios de la Realidad Nacional, 1995. Villanueva, Carlos, ed. Sandino en Yucatán, 1929-1930. Mexico: SEP, 1988. Walker, Fred. Destination Unknown: The Autobiography of a Wandering Boy. London: Harrap, 1934. Wearmouth, John Milton. "The Second Marine Intervention in Nicaragua: 1927-1932." Unpublished Masters Thesis, Georgetown University, 1952. Wünderich, Volker. Sandino en la costa: de las Segovias al litoral atlántico. Managua: Editorial Nueva Nicaragua, 1989. Wünderich, Volker. Sandino: una biografía política. Managua: Nueva Nicaragua, 1995. Beals, Carleton. "With Sandino in Nicaragua." The Nation, Feb. 22 to April 11, 1928. Belausteguigoitia, Ramón de. Con Sandino en Nicaragua: La hora de la paz. Madrid: Espasa-Calpe, 1934. Cuadra, Abelardo. Hombre del caribe. Sergio Ramírez, ed. San José: EDUCA, 1977. Gilbert, Gregorio Urbano. Junto a Sandino. Santo Domingo: Publicaciones de la Universidad Autónoma de Santo Domingo, 1979. Sandino, Augusto C. El pensamiento vivo. Sergio Ramírez, ed. 2 vols. Managua: Editorial Nueva Nicaragua, 1984. Salvatierra, Sofanias. Sandino o la tragedía de un pueblo. Madrid: s.p., 1934. Aldaraca, Bridget, Edward Baker, Ileana Rodríguez, and Marc Zimmerman. Nicaragua in Revolution: The Poets Speak / Nicaragua en revolución: los poetas hablan. Minneapolis: Marxist Educational Press. 1980. Alexander, Alfonso. Sandino: Relato de la revolución de Nicaragua. Santiago de Chile: Eds. Emilla, 1937. Arrellano, Jorge Eduardo. Panorama de la literatura nicaragüense. Managua: Editorial Nueva Nicaragua, 1986. Arrellano, Jorge Eduardo. "Sandino en la poesía: 50 poemas sobre el General de Hombres Libres." Revista de Pensamiento Centroamericano 29 (143) August 1972: 3-24. Blandón, Chuno. Cuartel General. Managua: La Ocarina, 1988. Cabezas, Omar. Fire from the Mountain: The Making of a Sandinista. New York: Signet, 1985. Cardenal, Ernesto. Flights of Victory / Vuelos de victoria. Marc Zimmerman, ed. and trans. New York: Orbis, 1985. Cardenal, Ernesto. Nicaraguan New Time, trans. by Dinah Livingstone. London: Journeyman, 1988. Cardenal, Ernesto. With Walker in Nicaragua. Jonathan Cohen, trans. Middletown, Connecticut: Wesleyan University Press, 1984. Cardenal, Ernesto. Zero Hour and Other Documentary Poems. Paul W. Borgeson, Jr., trans. and ed. New York: New Directions, 1980. Chávez Alfaro, Lizandro. "Nación y narrativa nicaragüense." 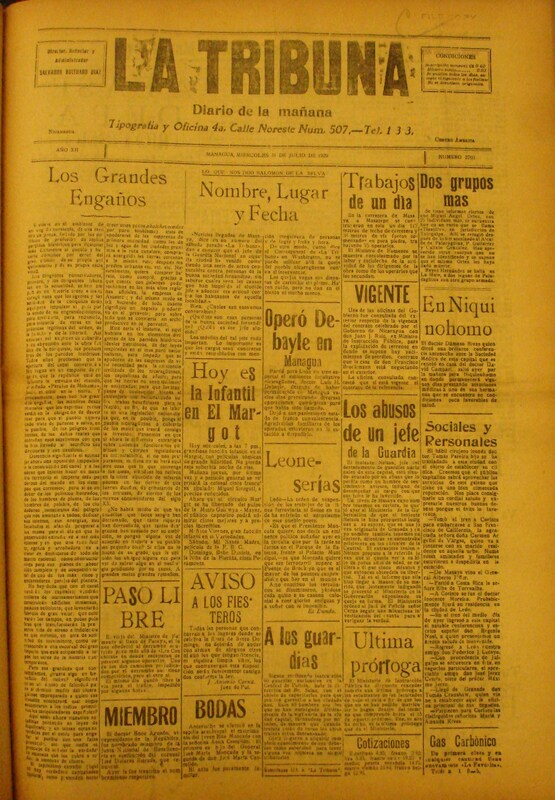 La Prensa Literaria, 16 March 1980. Coronel Urtecho, José. Prosa reunida. Managua: Nueva Nicaragua, 1985. Cuadra, Manolo. Solo en la compañía. Managua: Nueva Nicaragua, 1992. Cuadra, Manolo. El gruñido de un bárbaro. Managua: Nueva Nicaragua, 1994. Darío, Rubén. Poesía. Managua: Nueva Nicaragua, 1989. Guido, Clemente. El Chipote. Managua: Nicarao, 1978. Ramírez, Sergio, ed. Cuento nicaragüense. Managua: Nueva Nicaragua, 1986. Ramírez, Sergio. Castigo divino. Managua: Nueva Nicaragua, 1988. Ramírez, Sergio. La marca del zorro. Managua: Nueva Nicaragua, 1989. Robleto, Hernán. Sangre en el tropico: la novela de la intervención yanqui en Nicaragua. Madrid: Cenit, 1930. Santos Ramirez Calero J., ed. "Antología de poetas y escritores de Nicaragua." s.p., s.f., c.1976. Selva, Salomón de la. El soldado desconocido. Managua: Vanguardia, 1991. Selva, Salomón de la. Antología mayor. Managua: Nueva Nicaragua, 1993. Anderson, Benedict. Imagined Communities. London: Verson, 1983. Berger, John. Pig Earth. New York: Pantheon, 1979. Chatterjee, Partha. Nationalist Thought and the Colonial World: A Derivative Discourse? London: Verso, 1986. Clark, Samuel and James S. Donnelly, Jr., eds., Irish Peasants. Manchester, 1983. Comaroff, Jean and John Comaroff. Of Revelation and Revolution. Chicago: University of Chicago Press, 1991. Comaroff, John and Jean Comaroff. Ethnography and the Historical Imagination. Boulder: Westview Press, 1992.
Cooper, Frederick and Ann Stoler. "Introduction: Tensions of Empire." American Ethnologist 6 (4) November 1989: 609-621. Eckstein, Susan, ed. Power and Popular Protest: Latin American Social Movements. Berkeley: University of California Press, 1989. Eley, Geoff. "Review Essay: Nationalism and Social History." Social History 6 (1) January 1981: 83-107. Eley, Geoff, and Ronald Grigor Suny. Becoming National: A Reader. Oxford: Oxford University Press, 1996. Escobar, Arturo, and Sonia E. Alvarez, eds. The Making of Social Movements in Latin America. Boulder: Westview Press, 1992. Evans, Peter B., Dietrich Rueschemeyer, and Theda Skocpol, eds. Bringing the State Back In. Cambridge: Cambridge University Press, 1985. Foweraker, Joe, and Ann L. Craig, eds. Popular Movements and Political Change in Mexico. Boulder: Lynne Rienner, 1990. Gellner, Ernest. Nations and Nationalism. Ithica, N.Y.: Cornell University Press, 1983. Giddens, Anthony. A Contemporary Critique of Historical Materialism, vol. 2, The Nation-State and Violence. Berkeley: University of California Press, 1985. Ginzburg, Carlo. The Cheese and the Worms. Baltimore: The Johns Hopkins University Press, 1980. Guha, Ranajit and Gayatri Chakravorty Spivak, eds. Selected Subaltern Studies. New York: Oxford University Press, 1988. Guti‚rrez, Gustavo. The Power of the Poor in History. Maryknoll, N.Y.: Orbis, 1983. Hay, Douglas, Peter Linbaugh, John G. Rule, E.P. Thompson, and Cal Winslow. Albion's Fatal Tree: Crime and Society in Eighteenth-Century England. New York: Pantheon, 1975. Hill, Christopher. The World Turned Upside Down. London: Peregrine, 1972. Hilton, Rodney H. Bond Men Made Free. London, 1973. Hobsbawn, Eric J. Primitive Rebels. New York: Norton, 1959. Hobsbawn, Eric J. Bandits. London: Weidenfeld and Nicolson Ltd., 1969. Hobsbawn, Eric J. Nations and Nationalism since 1780. Cambridge: Cambridge University Press, 1990. Hobsbawn, Eric J. and Terence Ranger, eds., The Invention of Tradition. Cambridge: Cambridge University Press, 1983. Hobsbawn, Eric J. and George Rudé. Captain Swing. New York: Norton, 1968. Jenlin, Elizabeth. Los nuevos movimientos sociales. Buenos Aires: Centro Editor de América Latina, 1985. Johnson, Richard, et. al., eds. Making Histories: Studies in History-Writing and Politics. London: University of Birminghan, 1982. Joseph, Gilbert M. "On the Trail of Latin American Bandits: A Reexamination of Peasant Resistance." Latin American Research Review 25 (3) 1990: 7-54, and "Commentary and Debate," Latin American Research Review 26 (1) 1991: 145-174. Knight, Alan. The Mexican Revolution. 2 vols. Lincoln, NB: University of Nebraska Press, 1986. Kriesi, Hanspeter, Sidney Tarrow, and Bert Klanderman, eds., International Social Movements Research. London: JAI Press, 1988. Laclau, Ernesto and Chontal Mouffe. Hegemony and Socialist Strategy. London: Verso, 1985. Lafaye, Jacques. Quetzalcóatl and Guadalupe: The Formation of Mexican National Consciousness, 1531-1813. Chicago: University of Chicago Press, 1976. Mallon, Florencia. Peasant and Nation: The Making of Postcolonial Mexico and Peru. Berkeley: University of California Press, 1995. Moore, Jr., Barrington. Social Origins of Dictatorship and Democracy. Boston: Beacon Press, 1966. Moore, Jr., Barrington. Injustice: The Social Bases of Obedience and Revolt. New York: Pantheon, 1978. Said, Edward W. Orientalism. New York: Vintage, 1978. Scott, James C. The Moral Economy of the Peasant: Rebellion and Subsistence in Southeast Asia. New Haven: Yale University Press, 1976. Scott, James C. Weapons of the Weak. New Haven: Yale University Press, 1985. Seed, Patricia. "Colonial and Postcolonial Discourse." Latin American Research Review 26 (3) 1991: 181-200. Skocpol, Theda. States and Social Revolutions. Cambridge: Cambridge University Press, 1979. Slater, David, ed. New Social Movements and the State in Latin America. Amsterdam: CEDLA, 1985. Stern, Steve J., ed. Resistance, Rebellion, and Consciousness in the Andean Peasant World. Madison: University of Wisconsin Press, 1987. Stern, Steve J. The Secret History of Gender: Women, Men, and Power in Late Colonial Mexico. Chapel Hill: University of North Carolina Press, 1995. Taussig, Michael. "Culture of Terror - Space of Death. Roger Casement's Putumayo Report and the Explanation of Torture." Comparative Studies in Society and History 26 (3) July 1984: 467-492. Thompson, E.P. The Making of the English Working Class. London: Pantheon, 1963. Thompson, E.P. Whigs and Hunters: The Origins of the Black Act. New York: Vintage, 1975. Tucker, Robert C., ed. The Marx-Engels Reader. New York: Norton, 1972. Urban, Greg and Joel Sherzer, eds. Nation-States and Indians in Latin America. Austin: University of Texas Press, 1991. White, Hayden. Tropics of Discourse: Essays in Cultural Criticism. Baltimore: The Johns Hopkins University Press, 1978. Wolf, Eric. Peasant Wars of the Twentieth Century. New York: Harper & Row, 1969. Womack, John. Zapata and the Mexican Revolution. New York: Alfred Knopf, 1969. Connerton, P. How Societies Remember. Cambridge: Cambridge University Press, 1989. Fentress, James and Chris Wickham. Social Memory. London: Blackwell, 1992. Hawlbachs, Maurice. On Collective Memory. Chicago: University of Chicago Press, 1992. Passerini, Luisa. Fascism in Popular Memory: The Cultural Experience of the Turin Working Class. Cambridge: Cambridge University Press, 1987. Rowe, William and Vivian Schelling. Memory and Modernity: Popular Culture in Latin America. New York: Verso, 1991. Fellman, Michael. Inside War: The Guerrilla Conflict in Missouri during the American Civil War. New York: Oxford University Press, 1989. Linderman, Gerald. The Mirror of War. Ann Arbor: University of Michigan Press, 1974. May, Glenn Anthony. Battle for Batangas. New Haven: Yale University Press, 1991. Ross, Bill D. Peleliu: Tragic Triumph. New York: Random House, 1991.